“I wish the world was twice as big – and half of it was still unexplored” – Sir David Attenborough. 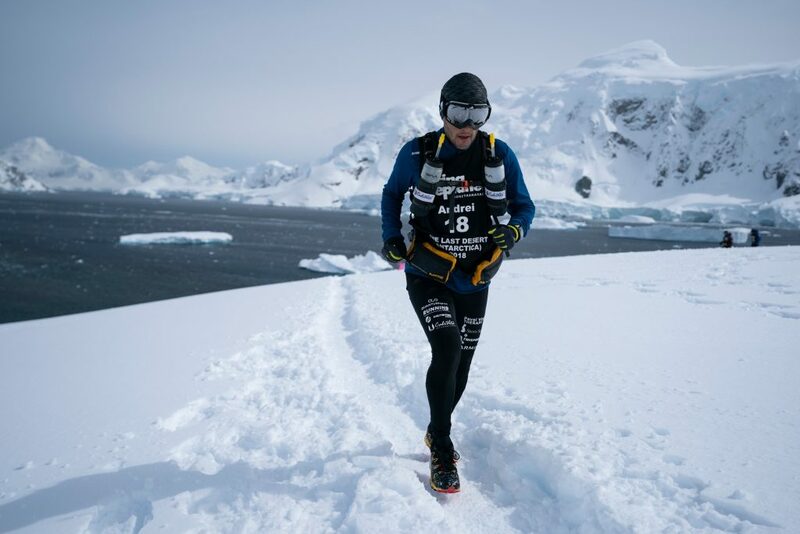 I was attracted by the idea of running on all seven continents from the very first moment when the thought shyly came into my mind. It was love at first sight, an inner call, an experience I always wanted. At the beginning, I had no clue what it would involve and how complex everything would be, in terms of planning, budget, physical effort, time spent away from my family. My inner explorer felt such an adventure would change my perception on everything around me and would feed my soul for the rest of my life. Isn’t this what matter most on this world? Maybe twenty years ago I’d given a different answer to this question. Maybe what mattered back then were a career, money and palpable, material things, generally speaking. But now I know and I can honestly tell that the only things that stay with you for the rest of your life and the only ones which are worth all your effort are the family and the experiences that feed your soul. Two years ago I started drawing the plans for an adventure that was abot to take me running, all over the world. Seven races, each covering between 250 km and 520 km, where I was to carry all my food and gear, racing for a full week in isolated and totally inhospitable areas on each continent, with temperatures varying between -20 C and +50 C. This is how CaliVita 7 Deserts project was born and I must admit I’m getting emotional thinking that all that separates me from its closure is one race, namely The Track (Australia) – 520 km of authentic Australian outback, this year, in May. So, there was Namib Race , with its brut and natural African beauty of the place where the Atlantic Ocean meets the world’s oldest desert, the Namib Desert. Then, 250 km running through Gobi Desert (China), on the old Silk Road. Running 273 km in Arizona and Nevada Desert, through the Grand Canyon made me realize how insignificantly small and sometimes powerless we are, compared to Nature. That was followed by Fire&Ice in Iceland, with its moody weather, its humidity and cold which I had to bear for a week, but with absolutely sensational landscapes, as of another world. 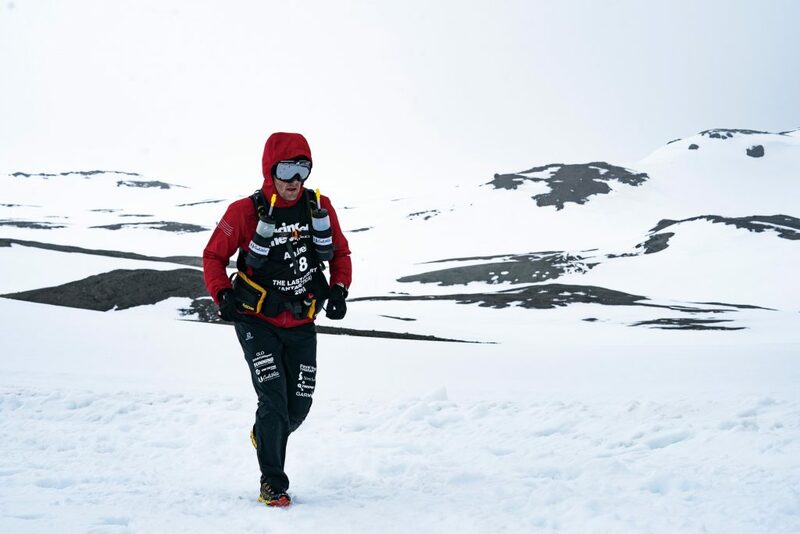 My next challenge after the negative temperatures was Atacama Desert (Chile), where my ability to adapt to high altitude was seriously put to the test during the 250 km run above 2500 meters. And so I got to the second last race of the project, the one I returned from in December and one I truly consider an experience worth having at least once in a lifetime. 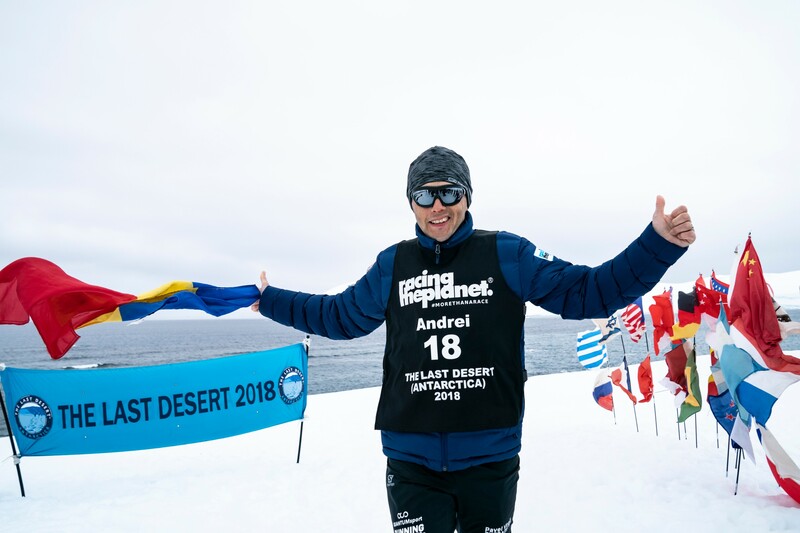 I’m talking about The Last Desert – Antarctica: up to 250 km running on the white continent, with all the challenges that derive from such an endeavor but also with the huge spiritual enrichment following that experience. 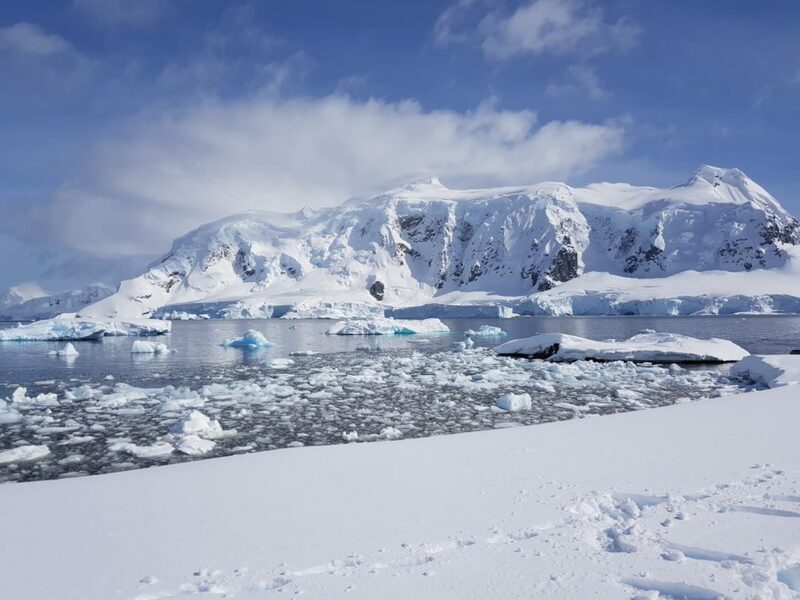 Antarctica – the final frontier, the continent which was subject to that many documentaries and books, a place that, during the last hundred years, attracted explorers, scientists, tourists and, more recently, athletes or regular people who want to experience the magic of that place. Because this is truly what you feel when you get there. 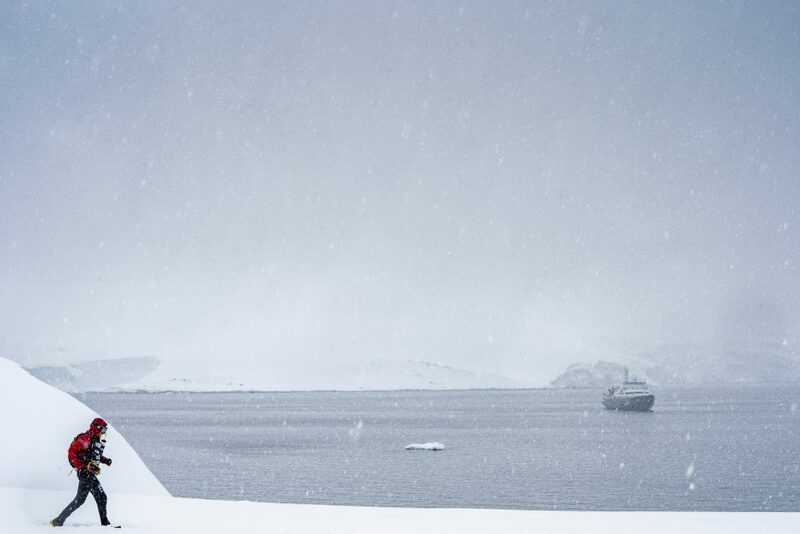 I don’t know how well I can put into words all Antarctica has to offer, but I’ll do my best to take you with me in a journey that, hopefully, will make you fall in love with this place and to determine you to put it on your travel list. 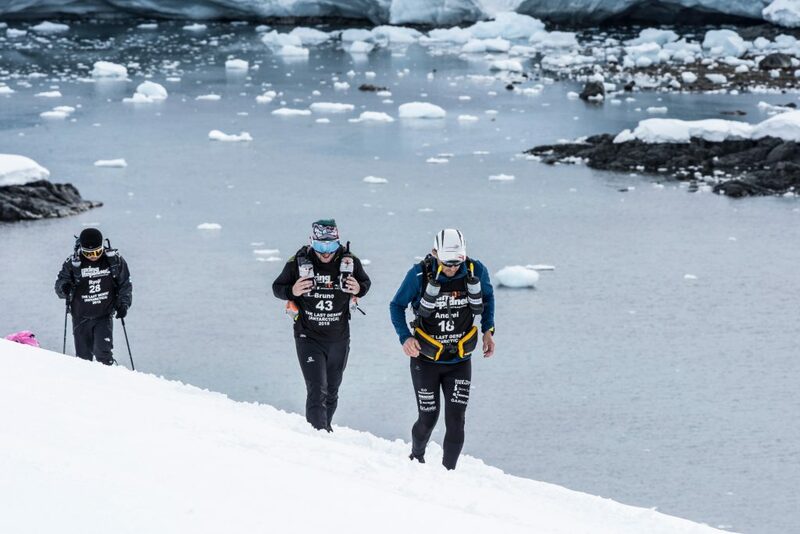 The race takes place every two years and is admirably organized by Racing the Planet; to be allowed to take part, one must have finished prior two of the following three races: Namib Race (250 km), Gobi March (250 km) or Atacama Crossing (250 km). As I already cleared this requirement even since 2017, when I did both Namib Race and Gobi March, all that was left to do was to begin my training and to plan the logistics. 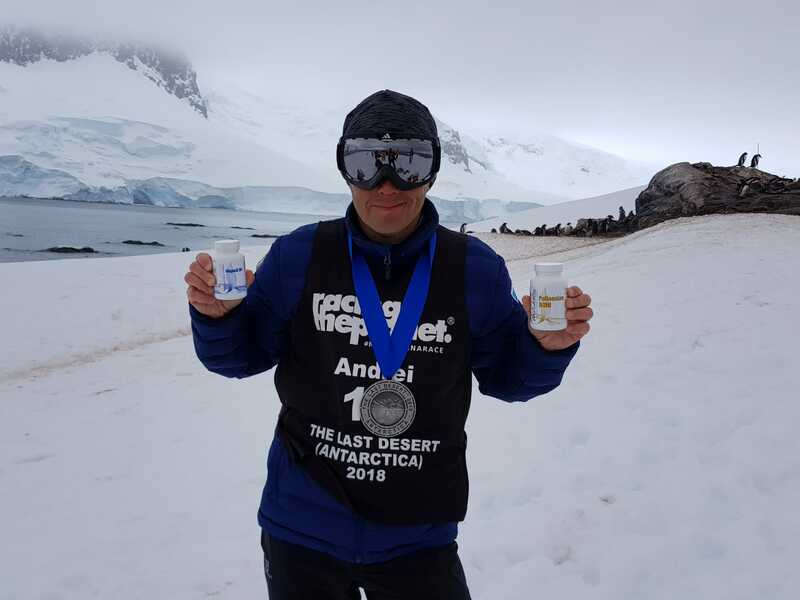 Regarding training, now that I write this I feel amused, as only three weeks prior to the race in Antarctica I returned from Atacama, where I managed an honorable 9th place in the general standings and in my struggle with running at high altitude. 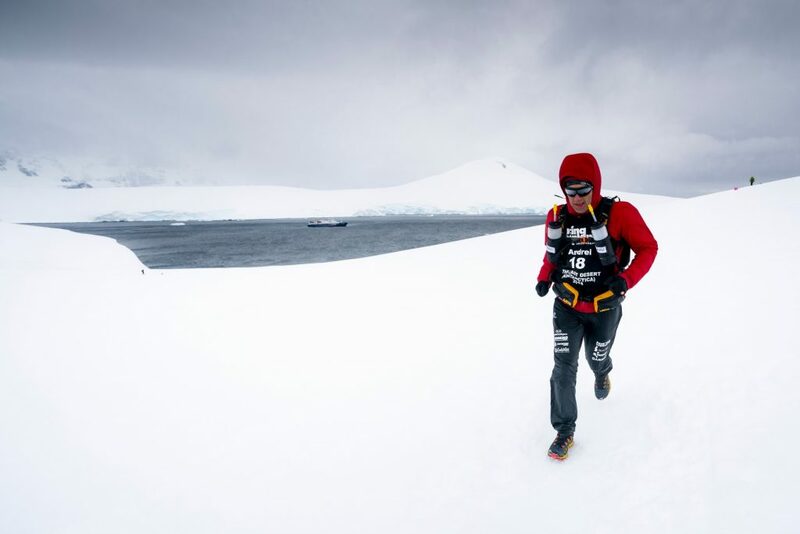 So there was hardly any time for recovery, not to mention any special training for Antarctica. I focused on the logistics details, on how to prepare for this expedition, adventure, mad thing or whatever you want to call it. I must admit that after Iceland (in September) and Atacama (October), The Last Desert – Antarctica (November) was the race I waited for all year long. “We may brave human laws, but we cannot resist natural ones” – Jules Verne. 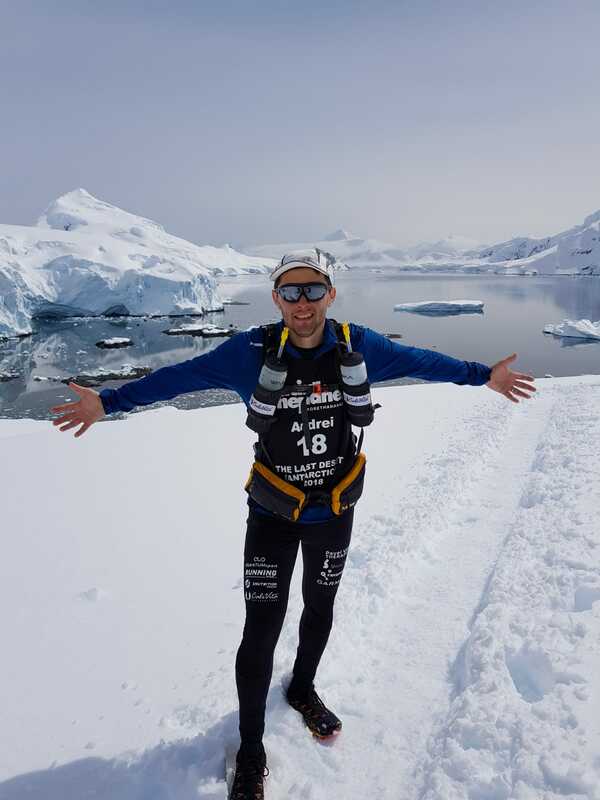 With the words of one of the writers I “devoured” as a child in mind, I leave for one of the most beautiful adventures yet: a 250 kilometers run in Antarctica. I cannot hide my emotions as I fell as happy as a kid in a toy store and totally fortunate to be able to do such a thing. I also depart humble, with a deep respect for nature in all its wilderness and splendor, and, if I’ll be allowed, I’ll reach and cross that finish line. This was what I wrote on my Facebook page one day before departure. 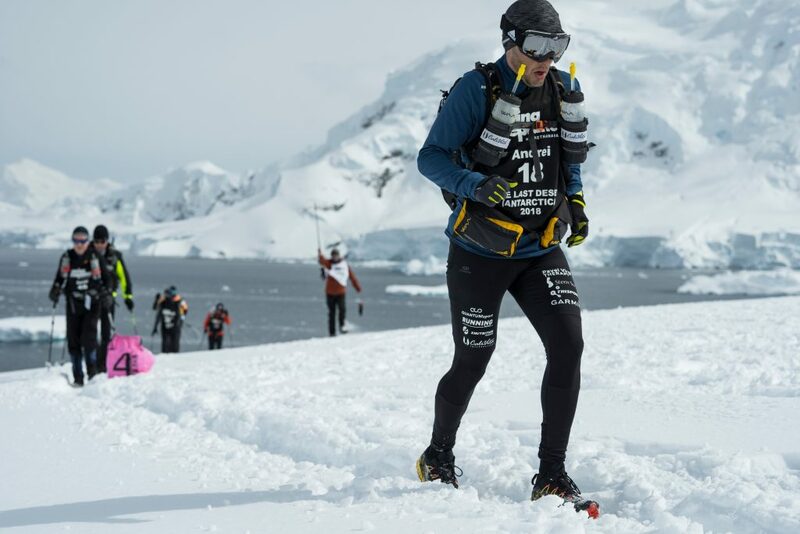 In order to reach Antarctica, both organizers and runners were to meet in Ushuaia (Argentina), the southernmost inhabited place on Earth. 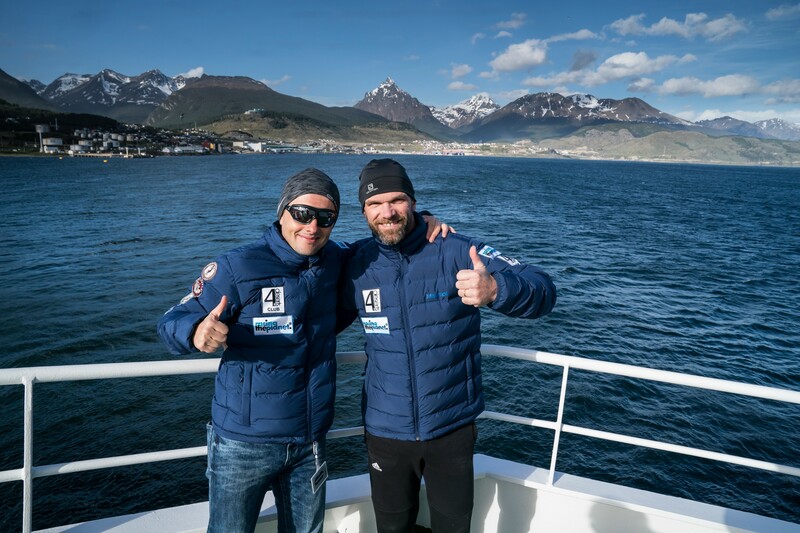 My itinerary was: Bucharest – Istanbul – Buenos Aires (with a two night’s stopover), Buenos Aires – Ushuaia and then two days by boat to King George Island in Antarctica archipelago, the place where the start of the race was set. 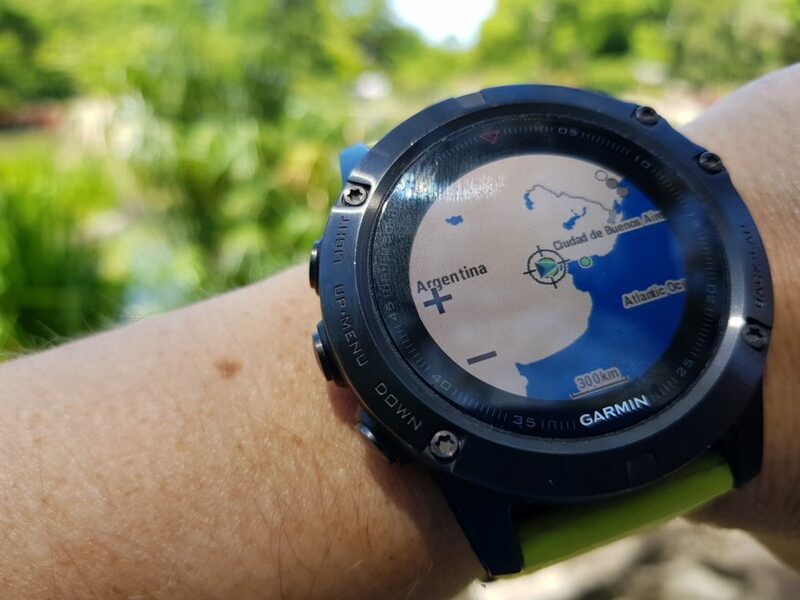 The trip to Buenos Aires was normal, without incidents (delays, lost luggage). 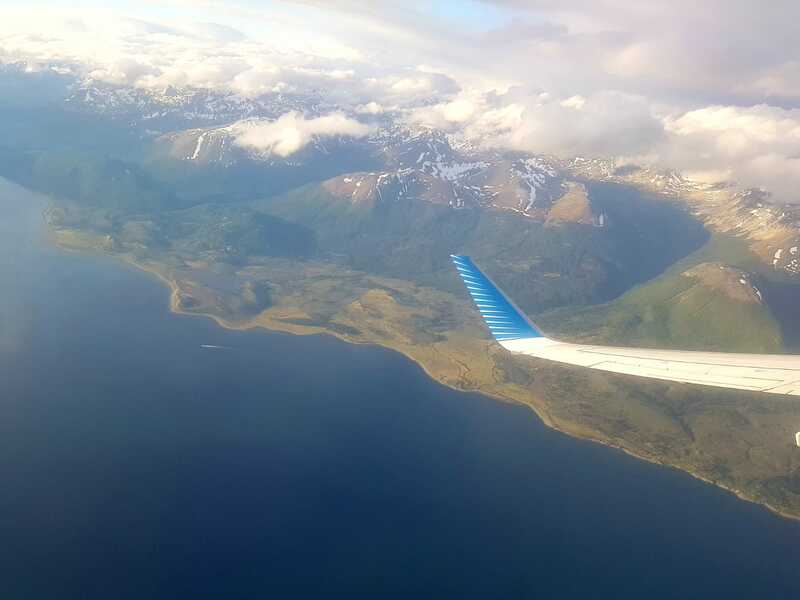 After a trip which lasted around 28 hours I landed in the capital of Argentina feeling surprisingly fresh, despite sleeping quite little in the plane. It was almost midnight and the thermometer read 25 degrees Celsius. 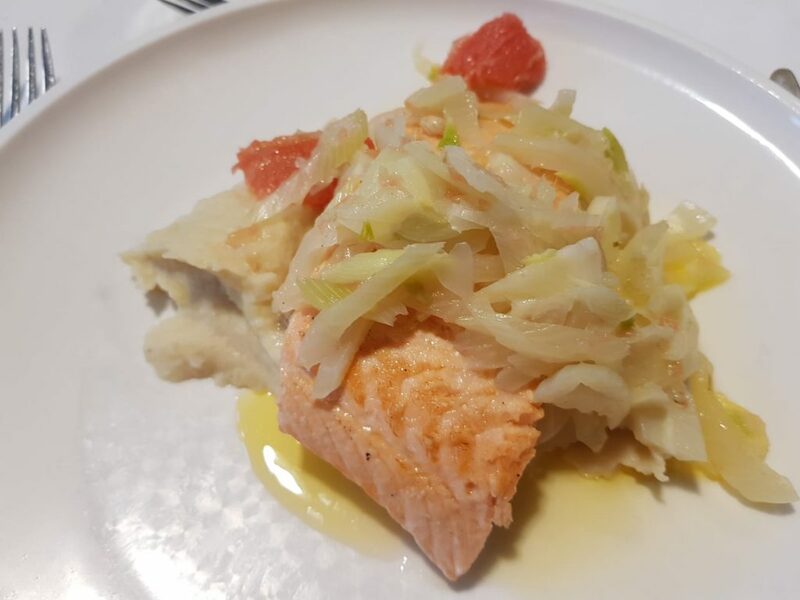 Coming from the 2 – 3 degrees in Bucharest, it was clear I didn’t fit in the general atmosphere and I attracted on several occasions curious looks from locals boarding the bus which was zig-zagging through town on taking me to my hotel. There was summer already in the Southern hemisphere while I was still dressed for winter. Of course I could have changed in the airport and take off the winter clothes, provided there was still room in my luggage to store them. Unfortunately, even if the temperature outside soared above 40 degrees, changing was not an option, as I could not fit one more needle into my luggage. I hardly managed to close it when I left home; despite putting some stuff into vacuum zip-lock bags in order to take as little space as possible, I was still at the limit for both my and baggage my hand luggage. So I bear with all the smiles and confused looks of my bus companions, while politely returning the same smile. One hour later I arrived at the hotel and checked in my room. Despite being located in a quite busy and noisy area, day and night, at least my windows were not facing the street so I managed to sleep like a log. I woke up the following day to the realization that Wi-Fi only worked at the reception and on the second floor. I was on the fifth. Big deal, I thought initially. Later on, pondering that every time I wanted to contact my family I had to descend to the reception, made me think to myself: “you’d better read the reviews on Booking next time, paps!”. Because it is useless to read that there is internet, if it is only available in a four square feet area. So, eyes in my phone, like I was looking for gold, hunting for at least one tiny Wi-Fi mark, I descended for breakfast. Local time 09:00, Romanian time 14:00. I was soo hungry, I’d have eaten the whole place, including the cook and the lady at the desk. Two slices of cheese, one croissant and a cup of tea later (that was pretty much it for breakfast) I got out of the hotel, looking for the first pizza place. It looked though that I had to exchange dollars for pesos, as regardless how hungry I was or how much Spanish I managed to learn from the telenovelas (or not) it looked like I could not pay with dollars. And so I started “hunting” for banks. I was going from one after another using Google Maps, only to receive the one and the same answer: “Bank customers only”. In other words, you were not their customer, they would not exchange your money. I couldn’t wrap my mind around this, as hard as I tried. 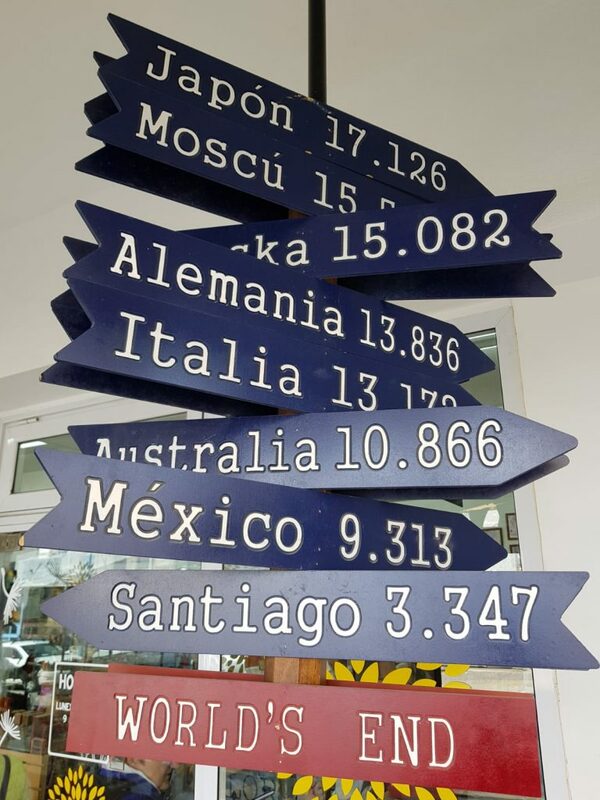 So, here you come, a tourist from the other side of the world, money on hand to spend, and you cannot do it because you’re not a customer of that bank? Really? I gave up with the forth bank and asked them if there were any exchange offices or banks where I could exchange dollars. They suggested an exchange office in a mall, 7 kilometers away. The distance wouldn’t have been a problem, if I wasn’t that hungry. I was there to run 250 kilometers in Antarctica, isn’t it? Despite being very hungry, I headed for the famous mall, trying to ignore all the stores and food stands on the way. Good thing I didn’t wake up earlier for my walk, as the mall only opened at 10:30 and I’d have been forced to wait by the door. Finally, I managed to locate the exchange office, bought pesos and felt like I won the lottery. I then got into the first pizza place and eat until I couldn’t stand up from my chair. I didn’t feel that happy in a long time. I have no clue how some can fast for days or even weeks on end, but definitely that is not for me. Better make me run for two weeks in a row, than being without food. 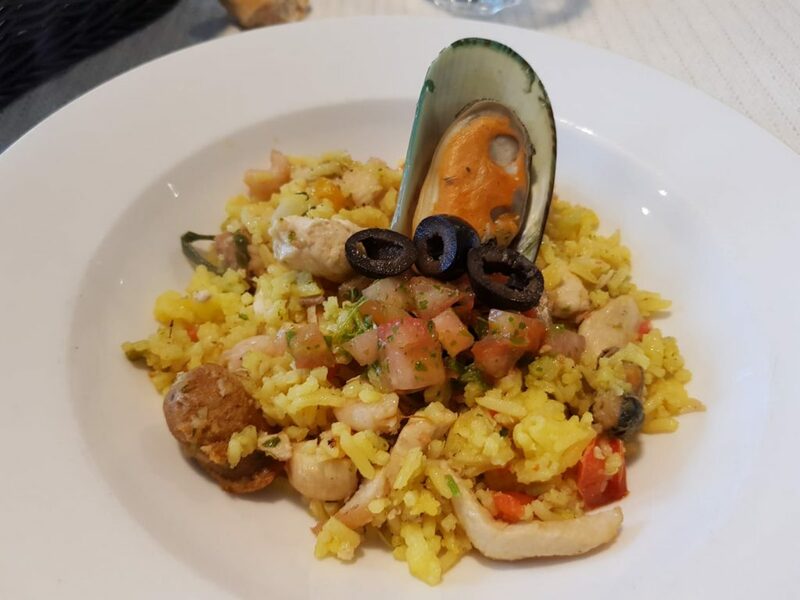 On a full belly and happy, I started on a stroll on Buenos Aires streets. It was the end of November and shops were getting ready for the festive season. Little stars, decorations, the works, as if Santa was to arrive any second now. Nothing strange, so far: it was normal, people were getting ready for Christmas, and shops greeted then with the famous Feliz Navidad. The only thing was that there were 32C degrees outside, people were wearing flip-flops, and swimming suits and sun hats were being showcased in the shops windows. 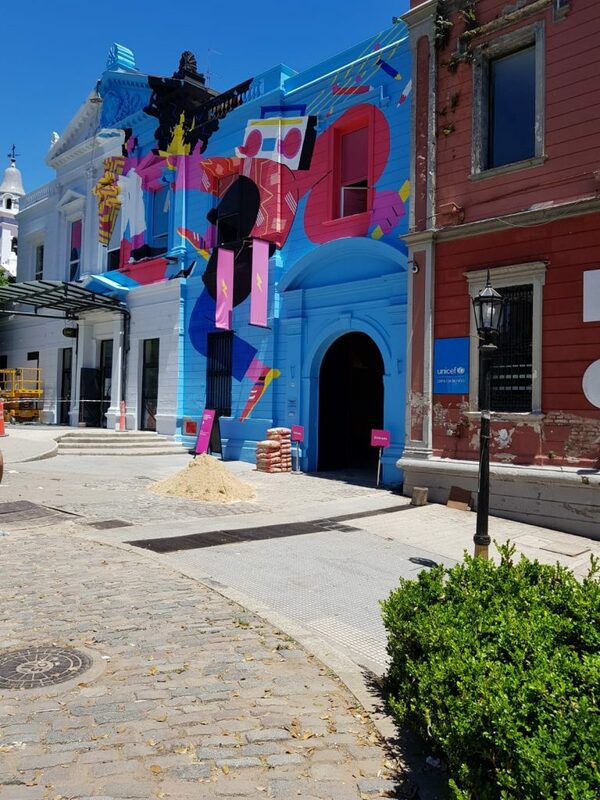 The feeling I got after walking through Buenos Aires for two days was that, despite managing to see maybe only 20% of it, it is for sure a place worth exploring. We’re dealing with a crowded city, featuring quite a big contrast between its center and its outskirts (just like everywhere else, I suppose) and a specific charm to it. One can totally experience the Latino feel to it, the noisy people, the street food and the discreet tango music when rushing past a bar. 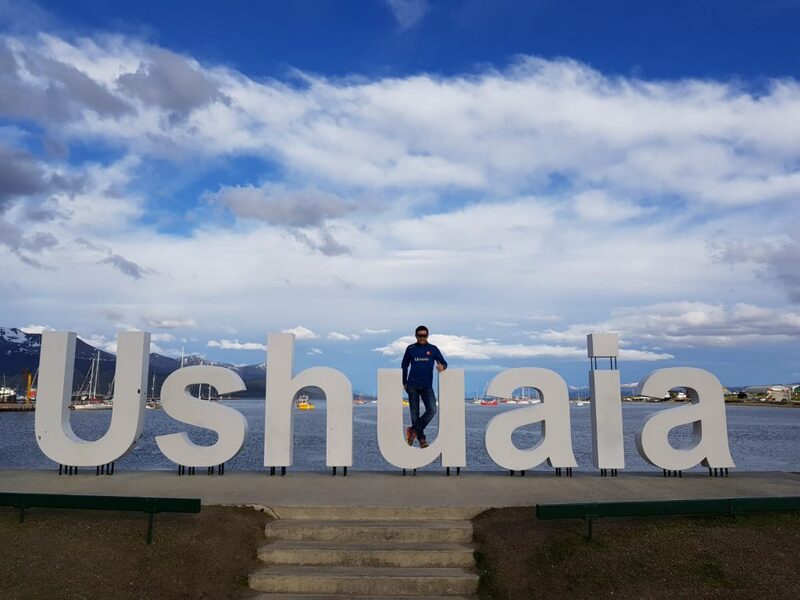 Ushuaia is filled with tourists during this period of the year, some departing for cruise trips in Antarctica, some being content just to visit the southernmost inhabited place on Earth and go to the tourist center to have the “Ushuaia – fin del mundo” visa stamped in their passports. 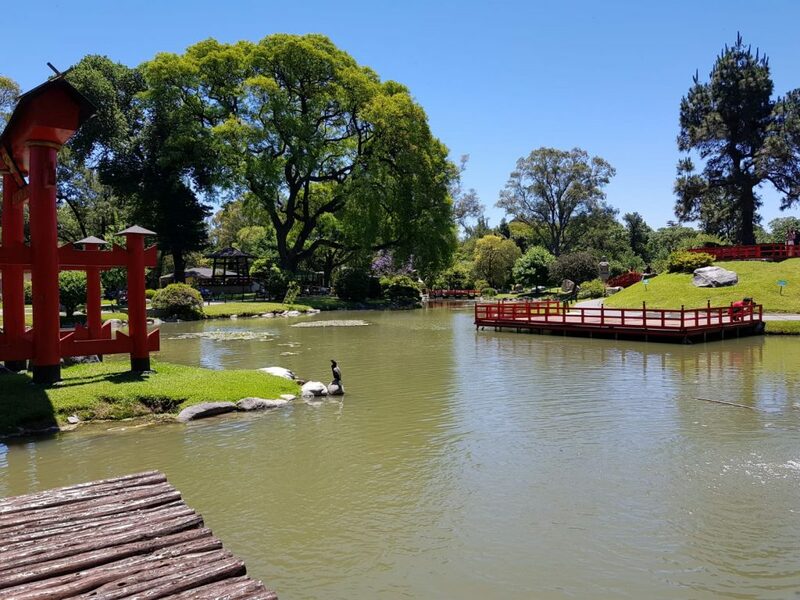 Covering an area of 23 square km and with a population of about 56.000 inhabitants, this little town at the end of the world is the place where the long string of South American Andes finishes and also the meeting point of two oceans: Atlantic and Pacific. 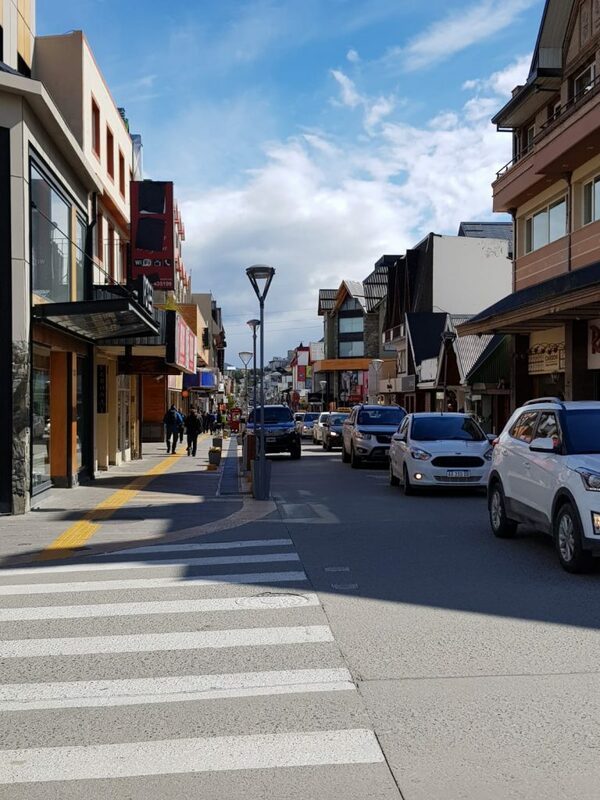 The municipality motto is: “Ushuaia, end of the world, beginning of everything” and indeed, you get the feeling you’re in a special place from the very first moment. I strolled for hours on its narrow streets, packed with shops – many of which selling sports and adventure equipment – pubs and small restaurants, hotels of all sizes but all offering a port view. 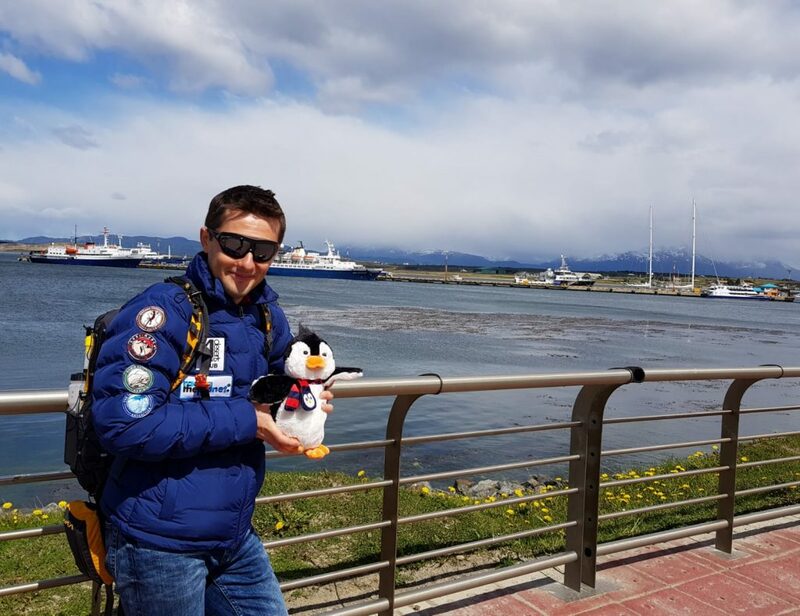 I slowly started to discover, among the other tourists, the ones who were to be my adventure mates in Antarctica, as here was the meeting point. 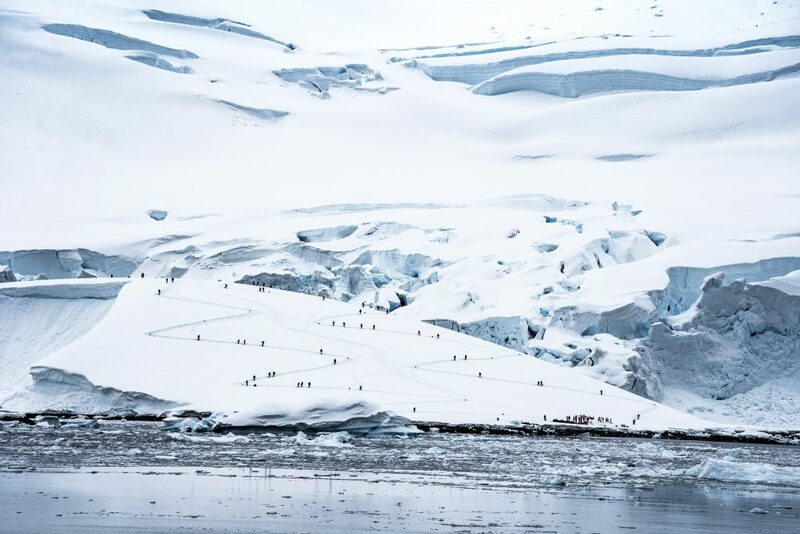 This is where we’d meet the organizers for the first technical briefing, board the ship and “set sail” for Antarctica. The following day at 16:00 all our group was present in the port, to board on MV Plancius, a ship which served for several years in the Dutch navy, before being transformed into a cruise ship fulfilling the dreams of thousands of tourists each year, by allowing them to visit the polar regions through its expeditions in the North or the South. 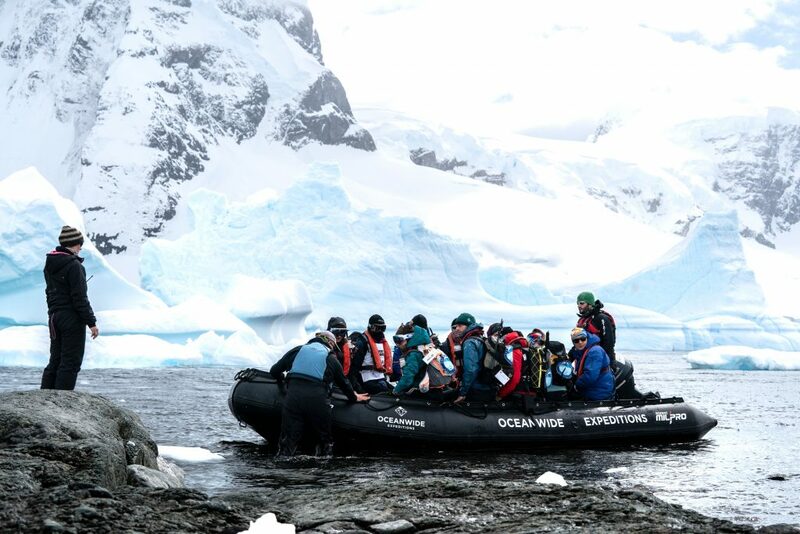 Oceanwide Expeditions is the company you’d definitely want to call for an experience like this. There might be other companies as well, but these people are true professionals in their field and make you feel completely safe next to them. Not to mention the quality of the expedition and of the information we received. 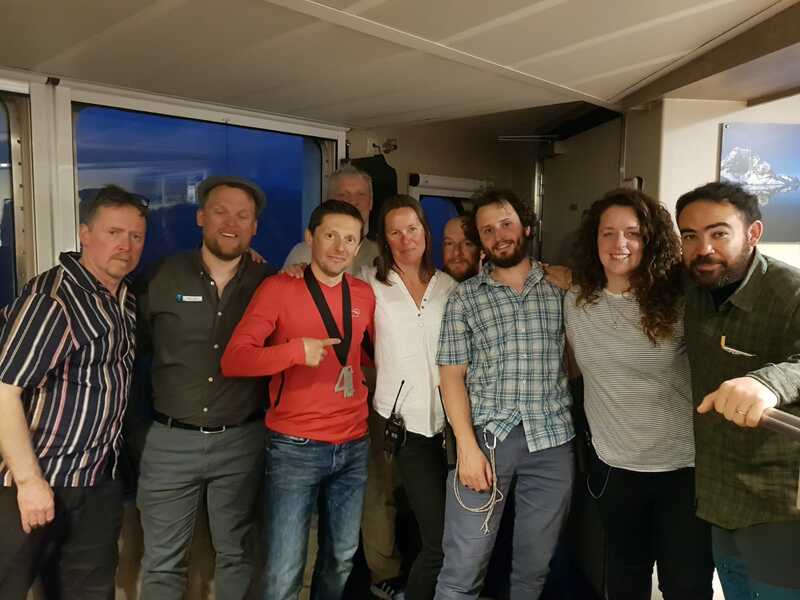 After a group photo I braced myself and started climbing the Plancius stairs towards the desk where our crew awaited to greet us and show us to our cabins. 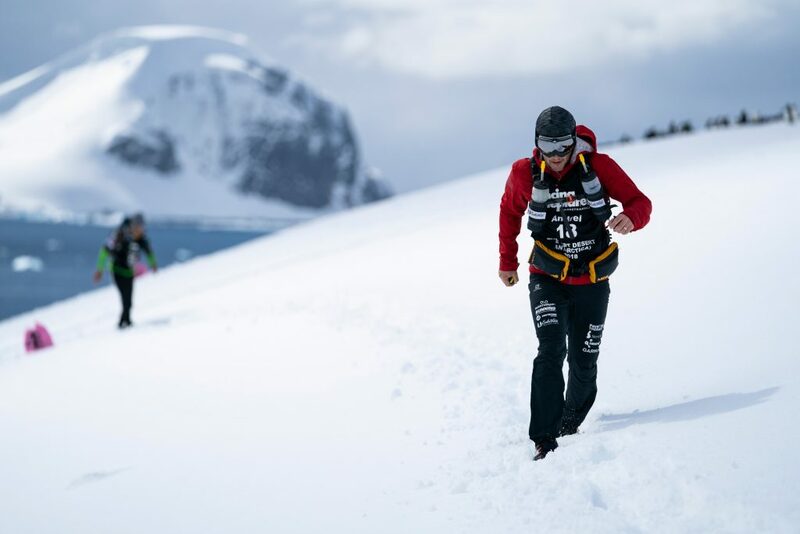 Here I must give you some background information, in order to understand the special format of this race in Antarctica. 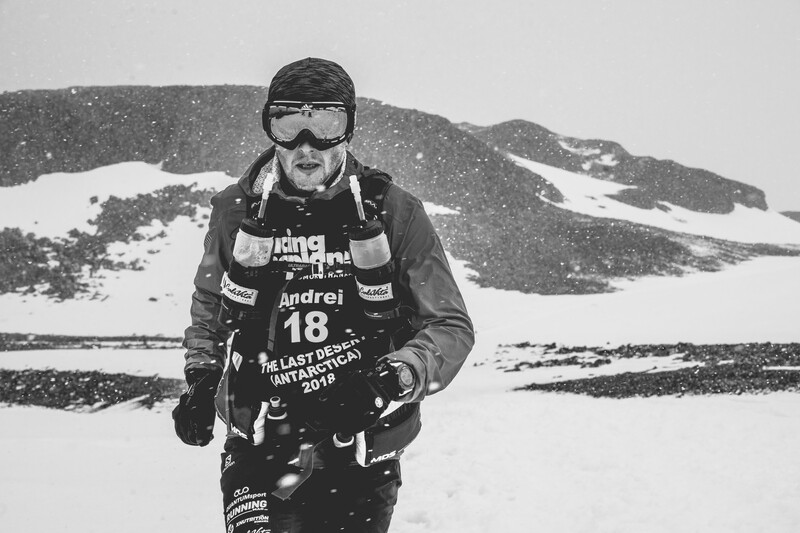 If you were curious enough to read the story of the races I took part in the last three years, you probably got used to this format: 250 km running over 6 stages (with preset distances each) with all the food and gear needed for the seven days cramped into a backpack. You needed to pack in such a manner as to get everything you needed to successfully fulfill the one week challenge. You forgot something? Tough luck! There was no place to get it from. The organizers only provided for the water in the hydration points and for the cover in a tent you shared with seven other people at the end of each stage. Anything else you might have needed should have been there in your everyday running backpack. 1. 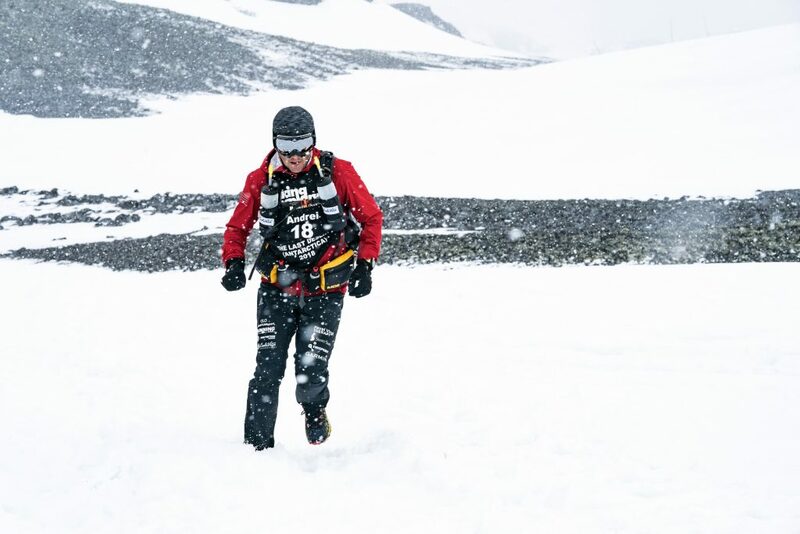 The first one is the totally unpredictable weather, which makes pre-setting a specific distance for each stage an almost impossible mission. In other words, instead of running a specific distance for each daily stage, there is a loop of 1.5 km – 3 km and a certain given time (5 – 6 – 10 – 12 hours). The distance each runner manages to cover during that given time is the distance for the stage. The second day, the same and so the distances covered in each stage are added up, the winner of the race being declared the runner who covered the closest distance to 250 km during those six stages. I was at sea for the first time and the slight rocking of the ship didn’t make me feel seasick. 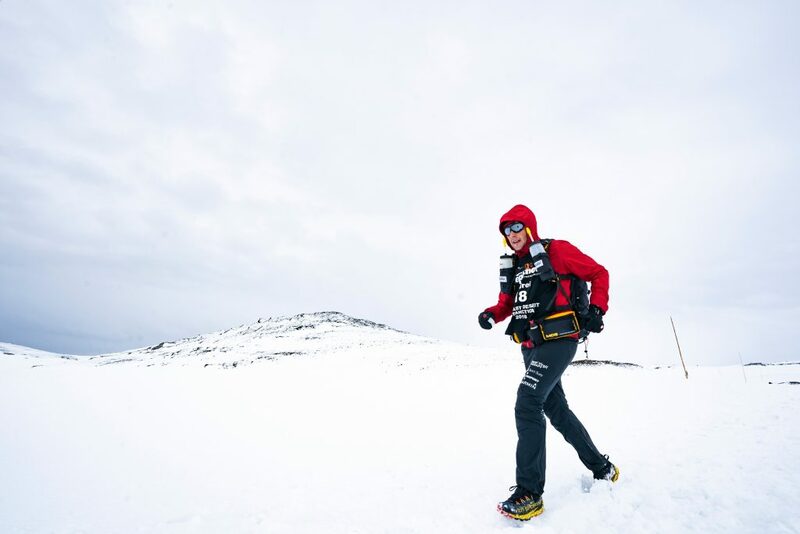 I started to think everything was going to be all right, as my deepest fear related to this race was not being able to get some rest due to the seasickness and hence being too tired during the day and not being able to run as I planned. 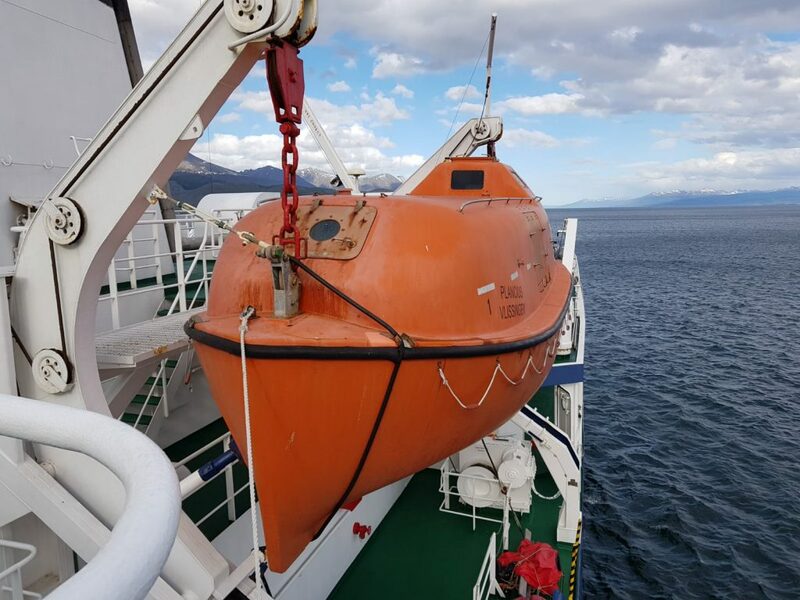 The ship’s doctor assured me that what I felt while still sailing through Beagle channel was nothing compared to when we’ll sail into the open ocean through Drake Passage. Although I brought some pills against seasickness, he convinced me on the spot to place behind my ear a plaster strip which slowly released over a period of three days a substance meant to ease the seasickness. It was more than enough to get me covered, as once we sailed through Drake Passage (which took a day and a half) the waters would be quieter. 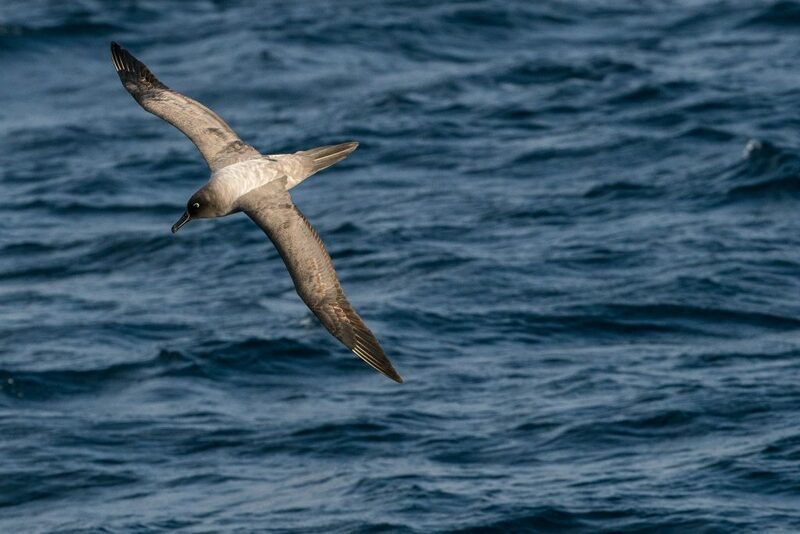 The Drake Passage is the stretch of water between Cape Horn (in South America) and South Shetland Islands (Antarctica). 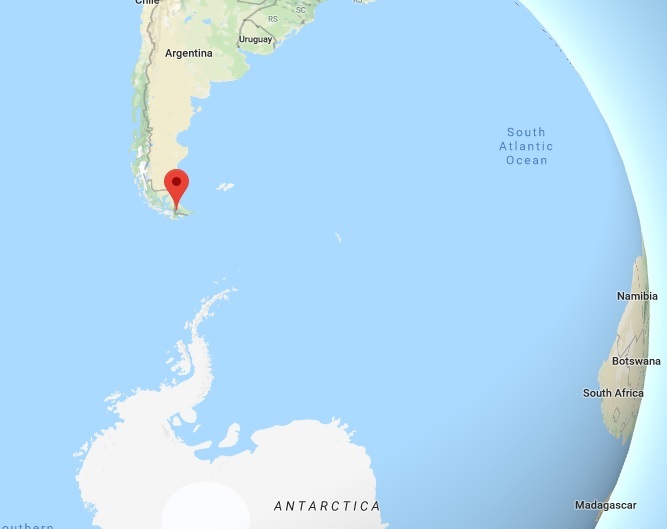 It also connects the south-western part of the Atlantic with the south-eastern part of the Pacific. This stretch of water didn’t exist until 41 million years ago. The Atlantic and the Pacific were completely separated and Antarctica was much warmer and without its ice cap. 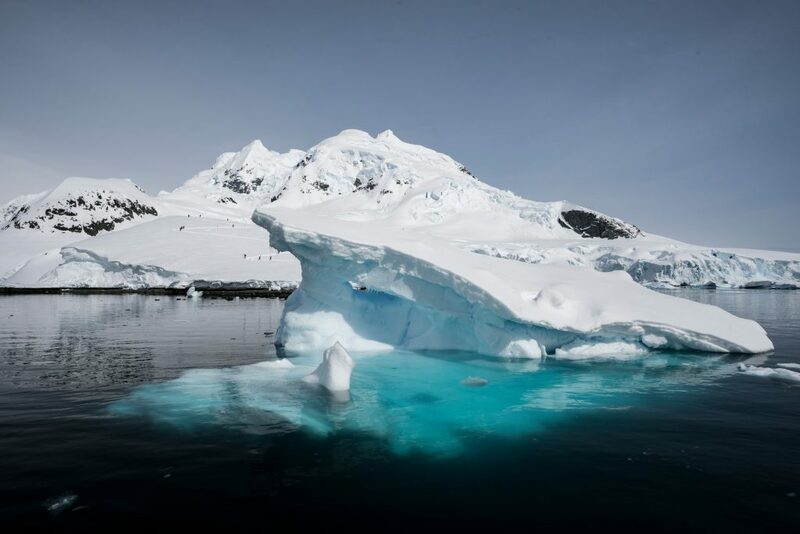 The merge of the two oceans gave birth to the Antarctic Stream, which moves annually a huge volume of water (about 600 times the volume of Amazon) towards Antarctica, which led to the significant decrease of the continent temperature. 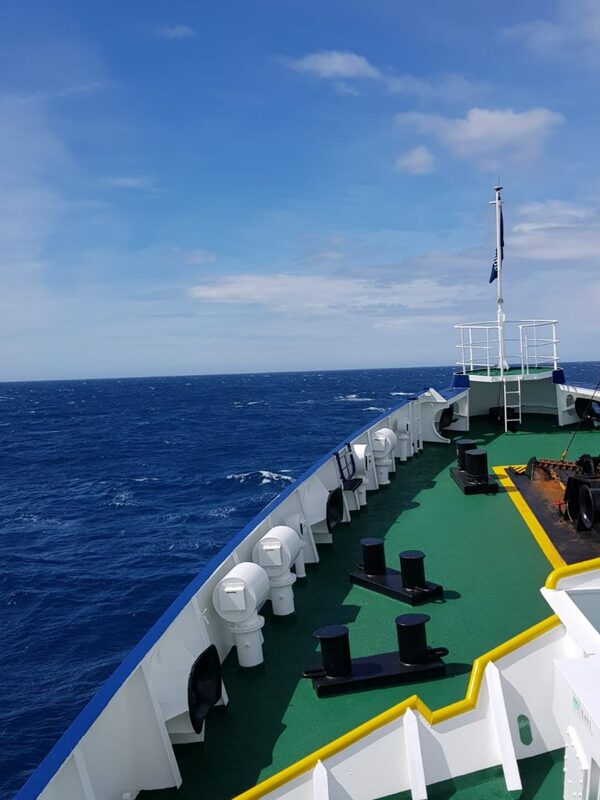 Due to the strong currents, Drake Passage is every sailor’s nightmare, the ships being frequently rocked by storms with waves exceeding even 10 meters. 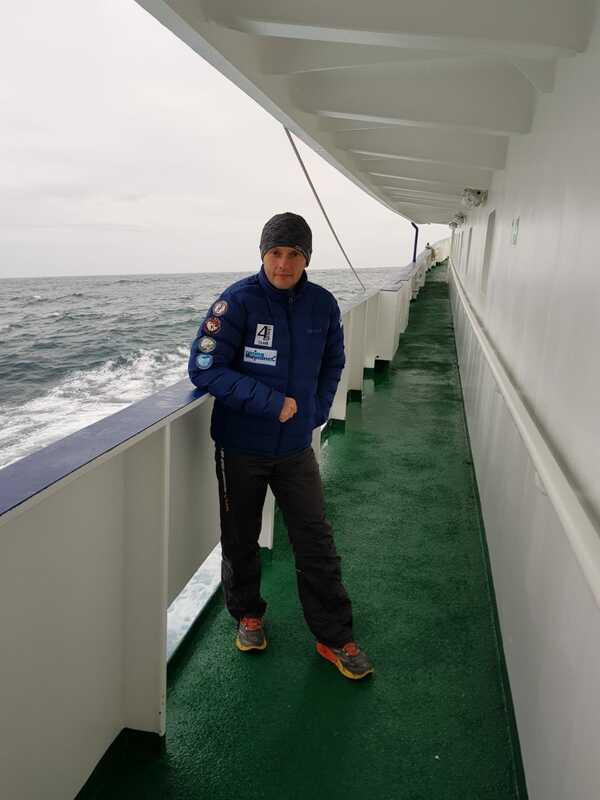 As soon as I set foot aboard, I planned on keeping a logbook, documenting my thoughts for each of our ten days long polar adventure. And despite some rocky times when I could hardly hold my phone and things were flying all over cabin, I did my best to write a few things every day, which I insert here, as they were written on the spot. I don’t know why I feel so emotional. Maybe because I never sailed before? Perhaps all this experience feels overwhelming? Or maybe simply because I “navigate” on completely unfamiliar terrain which scares me and which break all my anchors? I have no clue! But this makes me feel even better, makes me appreciate even more this place and makes me feel alive! 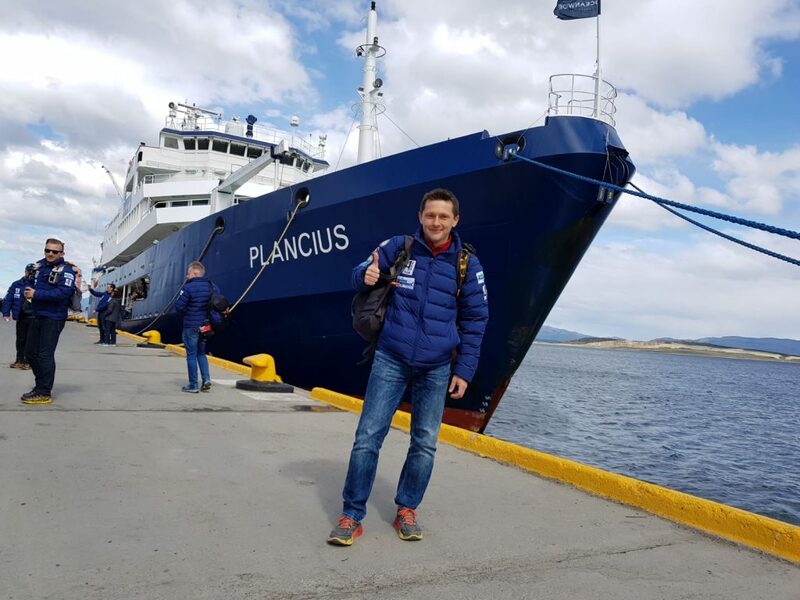 I stepped on the docks of Ushuaia port (in Argentina), where Plancius – the ship that once roamed the seas under the Dutch flag, only to carry nowadays the dreams and emotions of tourists from all over the world towards Antarctica – peacefully awaited for us. I was as happy as a child, despite not being totally convinced I fully understood what was happening to me. I climbed aboard, checked in my cabin and met Sebastian, a runner from Germany who was going to be my travel companion for the following ten days. As I opened the cabin door, my jaw dropped: despite not being big, it had all that’s required to feel the coziness of a home: shower, TV, a comfortable bed, even a wardrobe to put my stuff in! I know all this seems regular and of common sense but I got so used lately in all my previous races with being discomfortable that here it pleasantly surprised me. Sleeping in a tent with seven other people, on a cold and often uneven floor, using wipes to wash for a whole week, wearing the same clothes day in and day out and eating dehydrated food only, was a thing of the past. 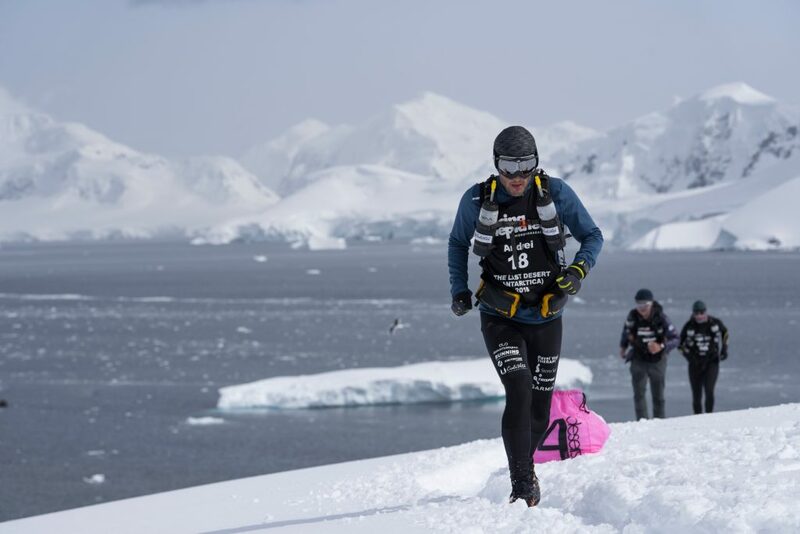 For this race we got access to our entire luggage, not only to our running backpack. Fact which created a whole new perspective on what one could eat between stages. 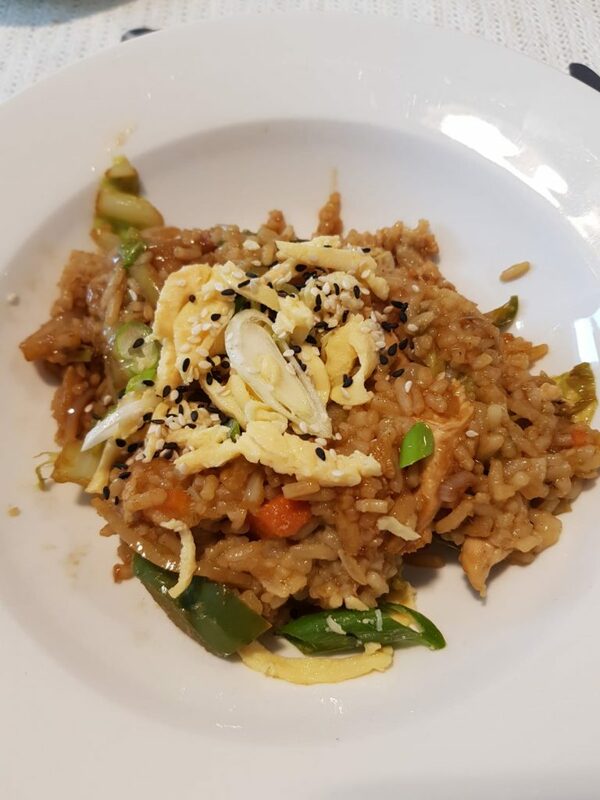 Practically, you could eat whatever you brought with, and we all know that balanced and diverse food (proteins from various sources, carbs, lipids) represent the main source of energy in ultramarathon. 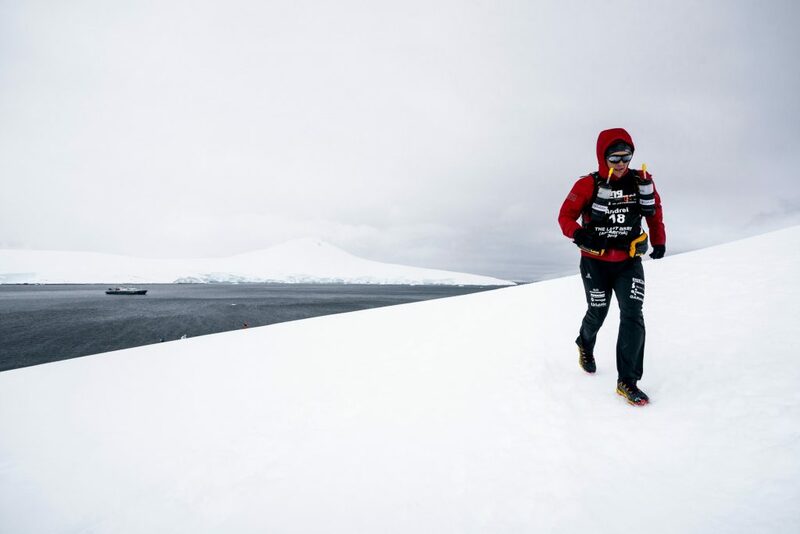 What makes this race different regarding food, compared to all my previous ones, is the fact that there are very few types of food you can take with you ashore to eat during each stage. 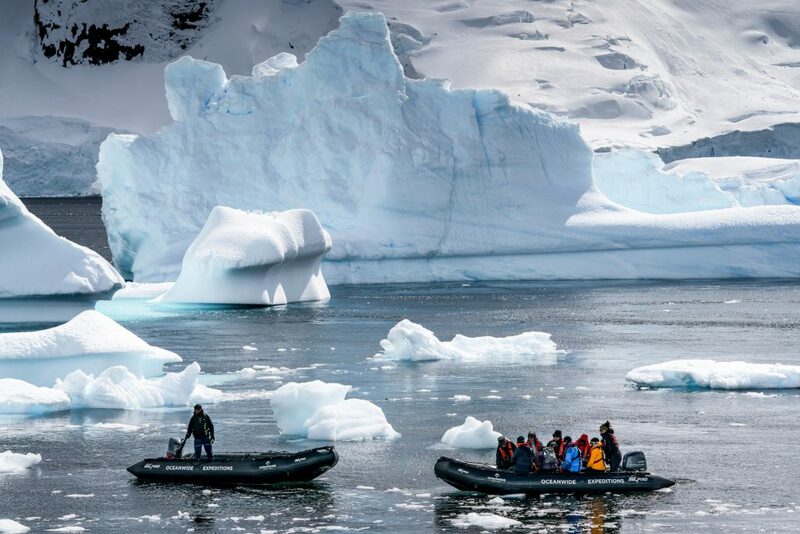 The IAATO (International Association of Antarctica Tour Operators) regulation drastically restricts this list, just because Antarctica is a 99% untouched continent which must stay like this for a long time to come. Therefore, anything containing seeds and nuts, which can fall on the ground and sprout are strictly forbidden. Meat as well, even dehydrated. No fruit or vegetables. No pastry. All paper or plastic wrapping is also forbidden, so we got to unwrap the food and place it in a casserole we were only allowed to open in the hydration point. The content of gels had to be transferred into plastic cans and the wrapping discarded on ship. 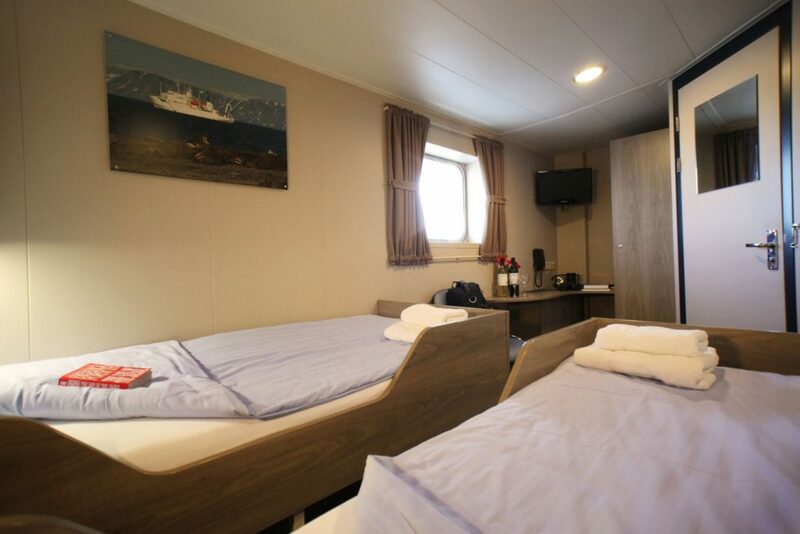 In return, the big advantage is getting to sleep aboard after each stage, as bivouacs are also prohibited on the continent. So for the next 10 days, we will refer to Plancius as home. 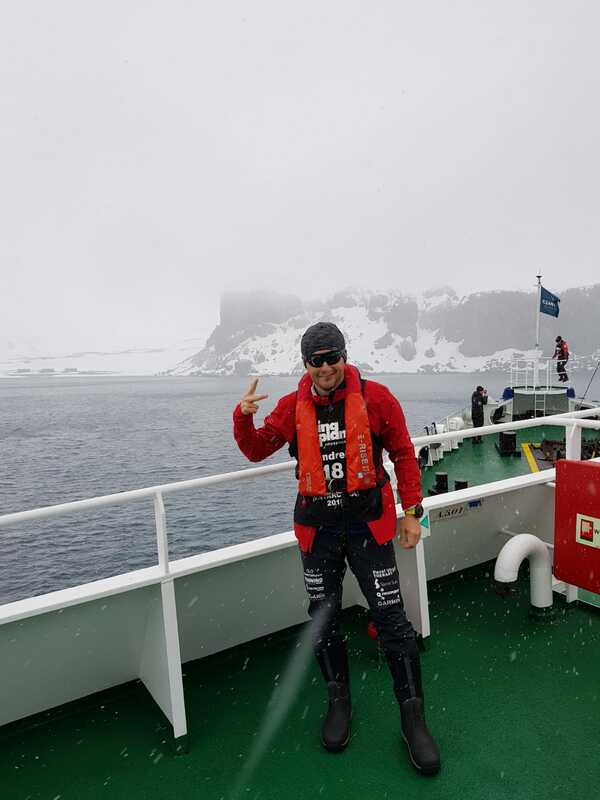 After long delays as three people’s luggage were missing, we finally left shore and started our 48 hours and around 2.000 km trip towards Antarctica. We were to sail in calm waters for the first few hours, but as soon as we would exit Beagle channel things were to become more “rockier” and that was to happen after midnight. The following day Drake strait awaited for us, a place well known to sailors for its difficulty. 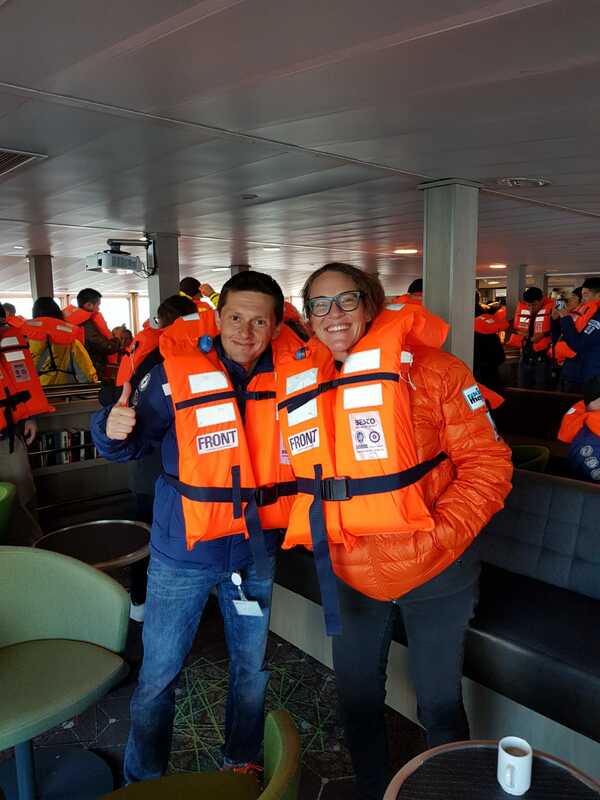 We toured the ship, we were introduced to the emergency drill and we were shown the life boats, which looked like mini-submarines, able to host up to 64 people shall we had to leave ship due to an emergency. I must admit I was fascinated by all these and listened very carefully to all details. It was something completely new for me and I believe for most of the 110 people aboard. They introduced the crew and I was surprised to learn that the second officer was a Romanian called Matei. It looks like we live in a small world, even here where it ends. 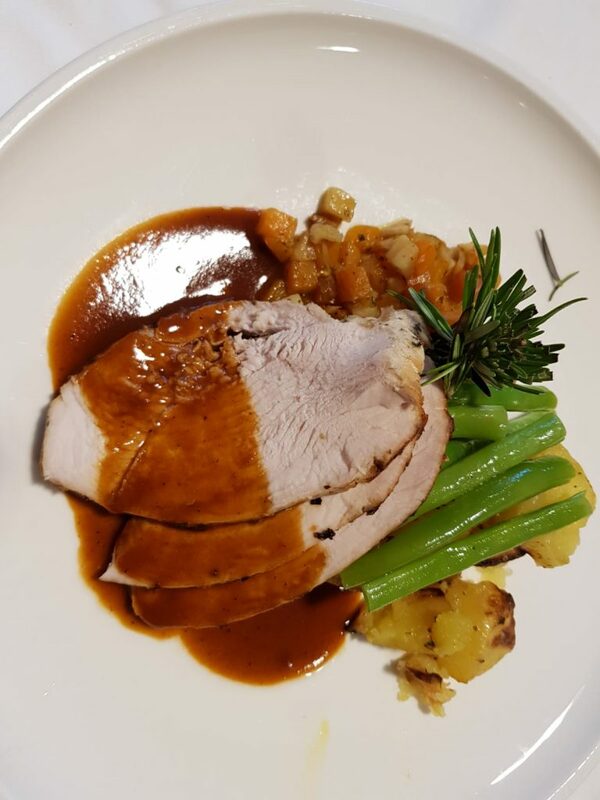 After that our supper was impeccably served aboard, by our staff which was paying attention to the most minute details. Despite being warned several times during technical briefings that this race was very tough and not to be taken lightly, I planned to push myself as hard as I possibly could during each stage and take advantage of the excellent living conditions aboard in order to relax. This was to be a race to live and enjoy with my heart and soul. I put on a patch against sea sickness and fell asleep, lightly cradled by the calm and quiet waters, with the adventure that awaited us in mind and thinking of Jules Verne’s books I so much enjoyed reading as a child. The previous evening I managed to go to bed and fall sound asleep at 22:30, despite the rocking. 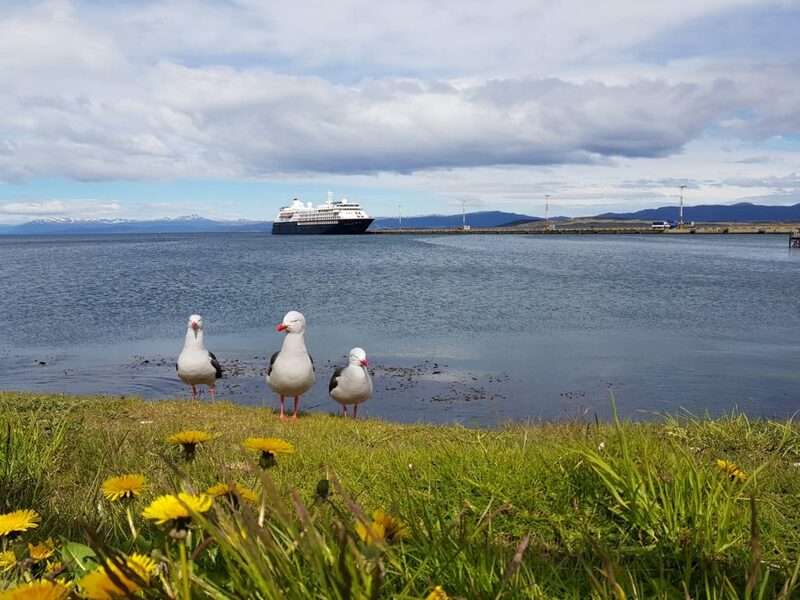 Although we were still sailing in Beagle channel on pretty calm waters, I felt my stomach contracting with each movement of the ship and all my inner organs wandering about from one place to another. A very peculiar feeling. To be able to get over this and fall asleep, I was saying to myself that this must have been how it felt when I was little and my mum was rocking me. I might even enjoyed it back then, but now I’m not so sure anymore 🙂 Anyhow, this thought was enough to be able to fall asleep. At 5am I woke up to the realization that I could hardly stand. 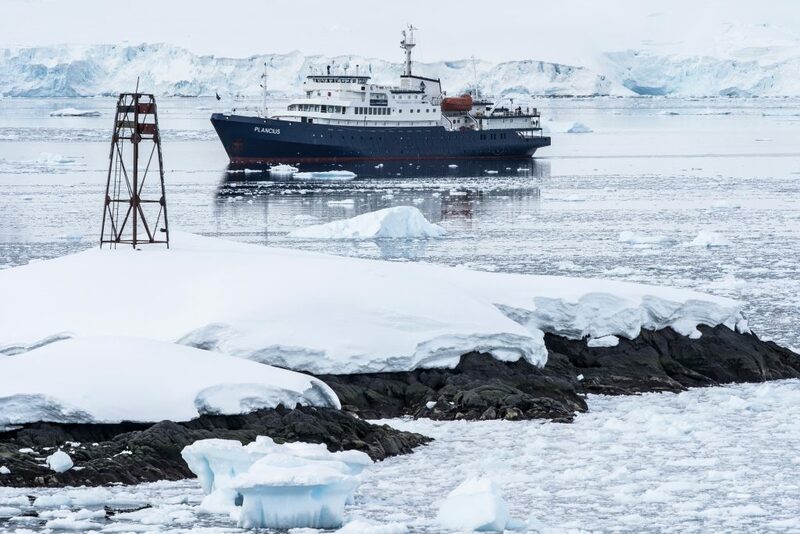 Plancius was shaking from all its bolts and nuts, making even standing look like a serious adventure. I looked through my cabin window at the endless stretch of water surrounding us. It was the break of dawn and the waves were slamming against the ship’s body, leaving a white foam behind. A new day aboard Plancius. The ship’s pitch was increasing by the minute. 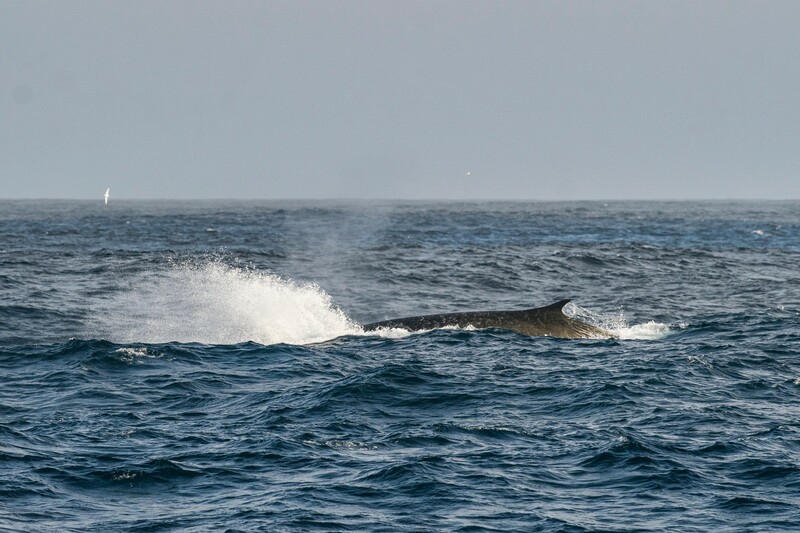 We were already sailing through Drake Passage for a few hours, a place where the waves usually reach ten meters high. 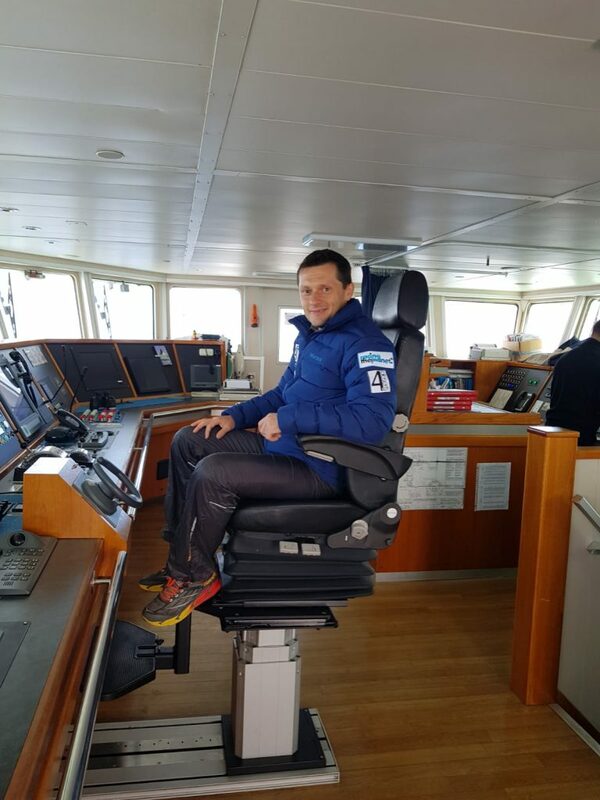 Luckily it wasn’t the case now, but even like this, it was a funny feeling, quite difficult to cope with, for someone at his first experience at sea. We then had breakfast, which honestly was richer and more diverse than in many other hotels I stayed in. As I entered the dining room, I was greeted by the smell of freshly baked bread, which proved to be the case. 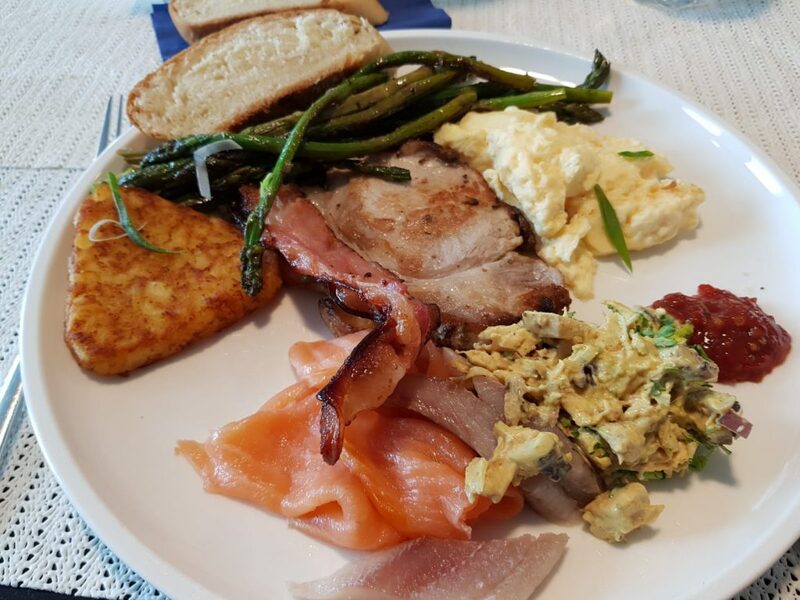 The bread as well as other many things served aboard was freshly homemade. After breakfast I went up on deck, to get some fresh air. I looked around and pretty much everybody seemed to more or less fight the seasickness. The sun was shining high in the sky, the waves weren’t that big so I figured I’ll go on deck to refresh my brains and shake somehow this nagging feeling of sleepy dizziness. We were then given a very interesting and informing presentation on penguins. 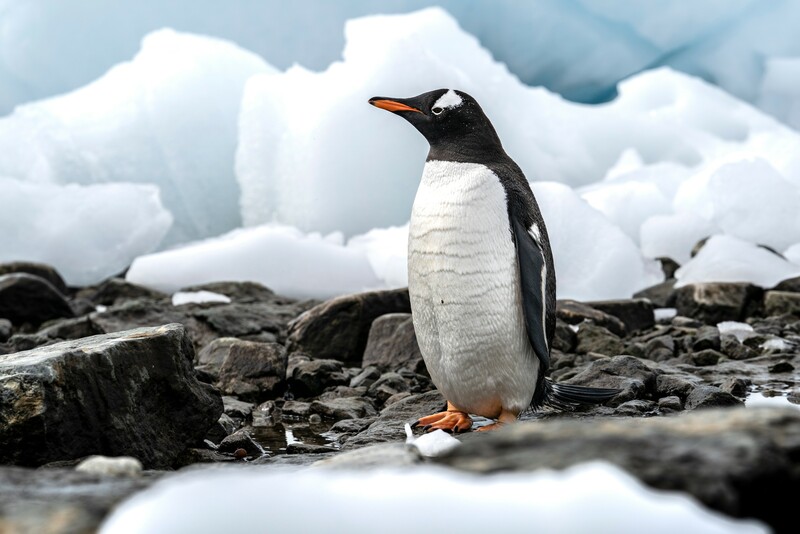 Out of the 17 different penguin species, we might possibly encounter only three: Gentoo, Adelie, and – if we were lucky – Imperial, although the latter are usually encountered way more South. 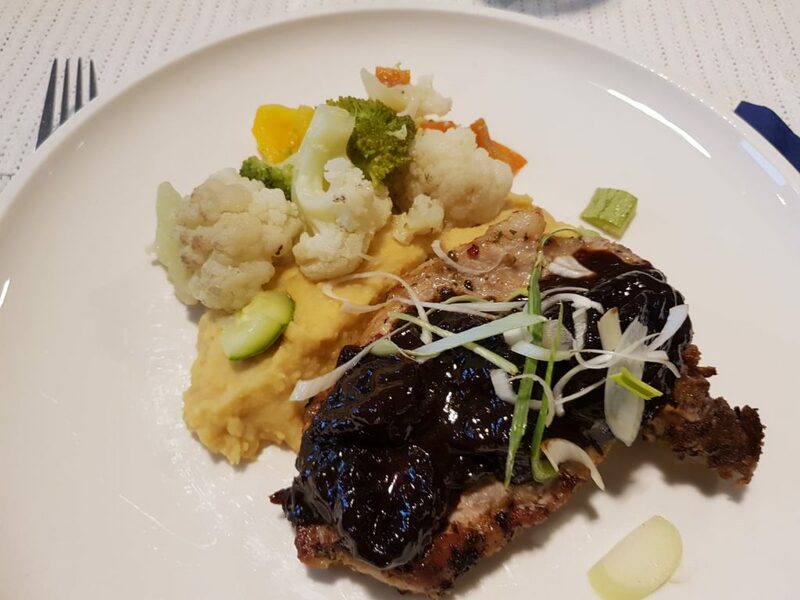 After the first 24 hours, things aboard started to slowly fall into some sort of a routine: breakfast, socializing, photos on deck, presentations by Oceanwide staff, lunch, socializing some more, dinner and sleep. Aw, and for all the remaining time between these, laying in bed like a veggie, in a state of permanent sleepiness, as an alternative to walking like a zombie, grabbing holds by the walls. I was pondering that one must really enjoy a lot working on a ship, in order to get past this feeling of perpetual rocking. 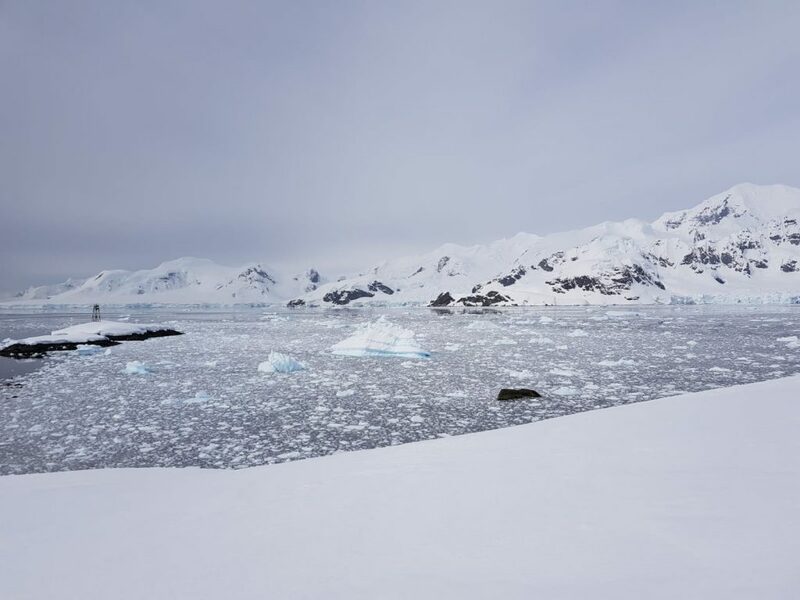 Tomorrow evening we’ll reach South Shetland Islands and head towards King George Island, the place where we’ll start on our first stage on Monday. 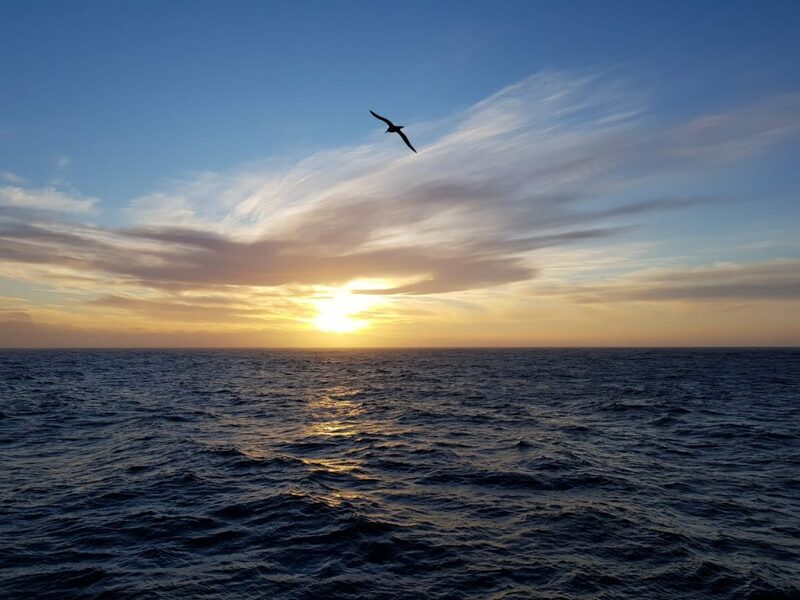 A new day in Drake Passage. I woke up feeling totally bewildered, dumbfound and already tired. Waves dangled our ship left and right all night long, but as beds in our cabin were installed perpendicular on the waves, we experienced this left-right rocking as up and down, while being in bed. In other words, we were alternatively hitting our heads and our feet by the bed board. All I could recall from that night was that, at some point, in order to stop being thrown around my bed, I grabbed the bed board and most likely fell asleep like this. We were briefed just a few minutes ago that tomorrow it looks like we’ll start with a 12 hours stage. 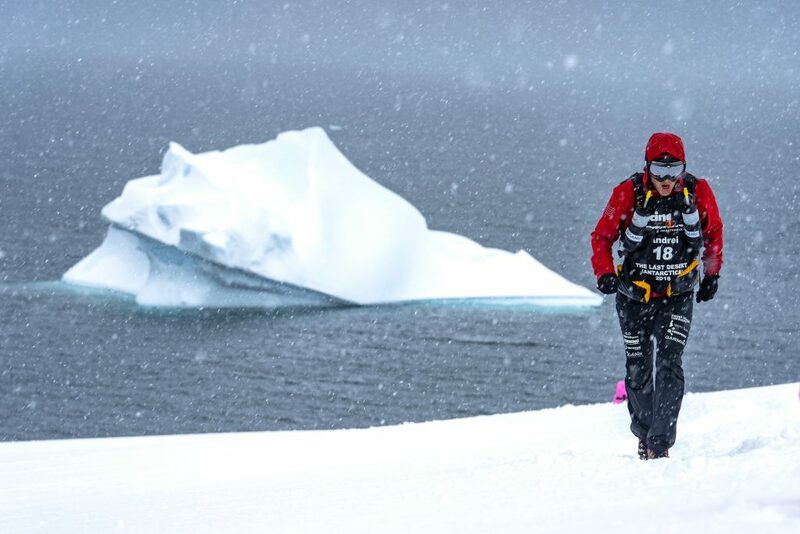 The organizers want to make sure we cover as many kilometers as possible in the first 2-3 stages, as due to the totally unpredictable weather we might not be able to spend that much time ashore after. 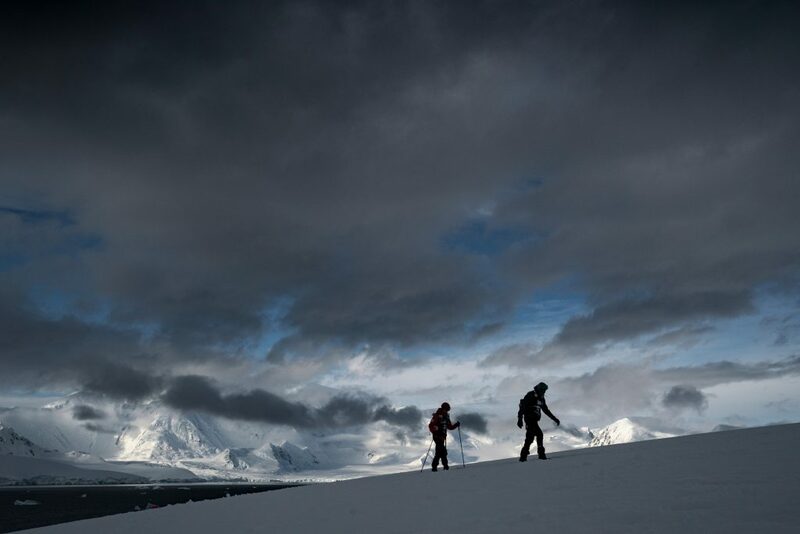 We would run on a 14 kilometer loop, with no significant vertical gain, on soft, fluffy snow. For the next stages we’ll also gain some vertical meters. If all goes well, the plan would be to cover 100 km tomorrow, but nothing is sure with this weather. We all talk and plan aboard, but we are aware we are at nature’s mercy. Today a few whales showed up by the ship, while albatrosses accompanied us ever since we left Beagle Channel. 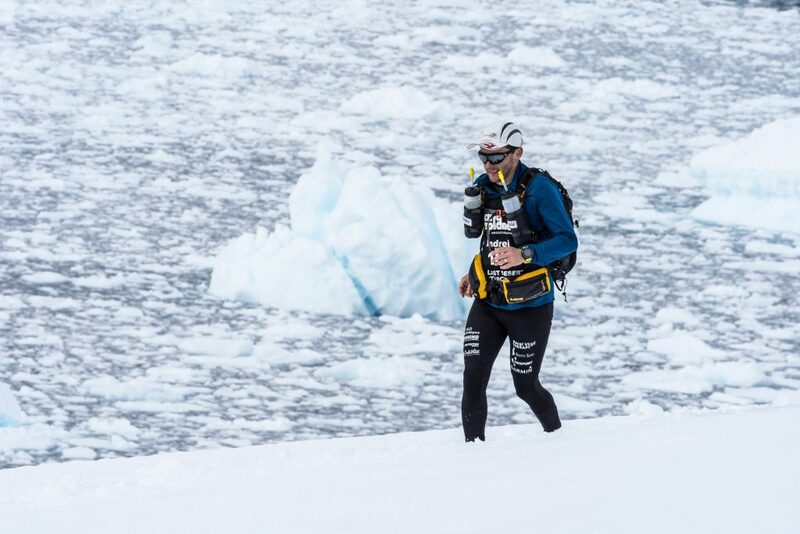 We returned to the ship sooner than expected, as organizers only allowed 10 hours of running instead of 12, due to the strong winds forecasted for the afternoon, which would made getting back on board from the shore very difficult, if not impossible. When I woke up in the morning and looked out the window, I shouted “Land ahead!” without even realizing it. It was the first thing other apart from the ocean that we saw in two and a half days’ time. 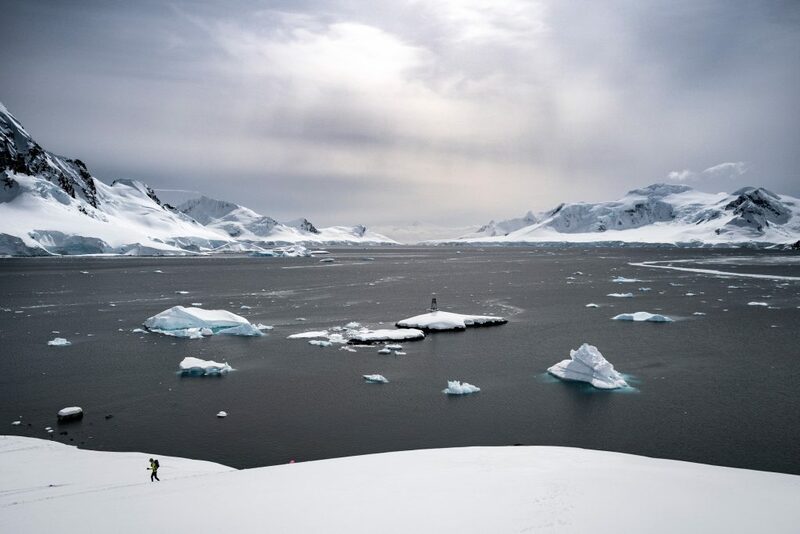 We reached King George Island, in Antarctic Archipelago. We boarded ten people each in the pneumatic boats which took us ashore. 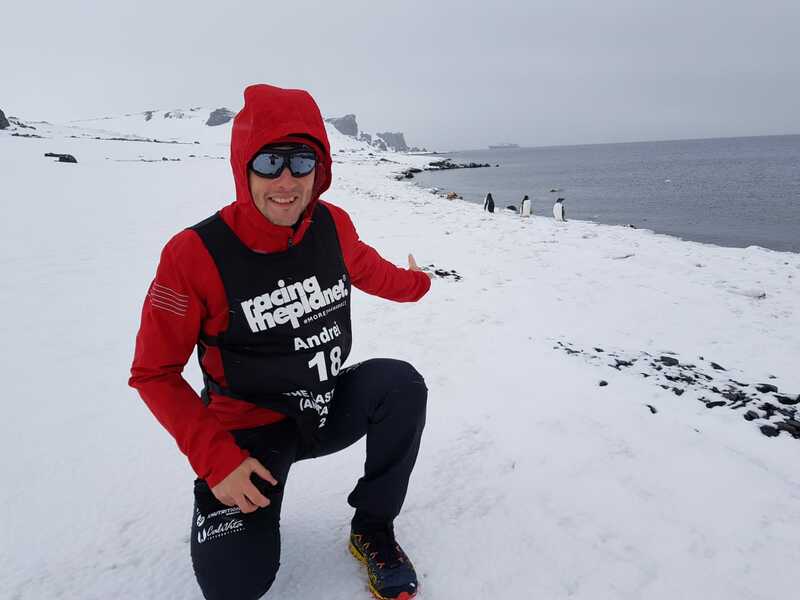 I instantly knew my karma for this race was going to be a good one, as three Gentoo penguins greeted me as I set foot for the first time on Antarctic soil. I decided to fully enjoy it, to stop in order to take photos and videos, as this was a “once in a lifetime” opportunity that I wanted to experience with all my senses. I spent too much time with my head in the trail, pushing myself to the limit for a better spot in the general tables. It was time to change the approach. This race was going to be one for the heart, for the soul. Of course I want a top 10 placement, but not regardless of the price. 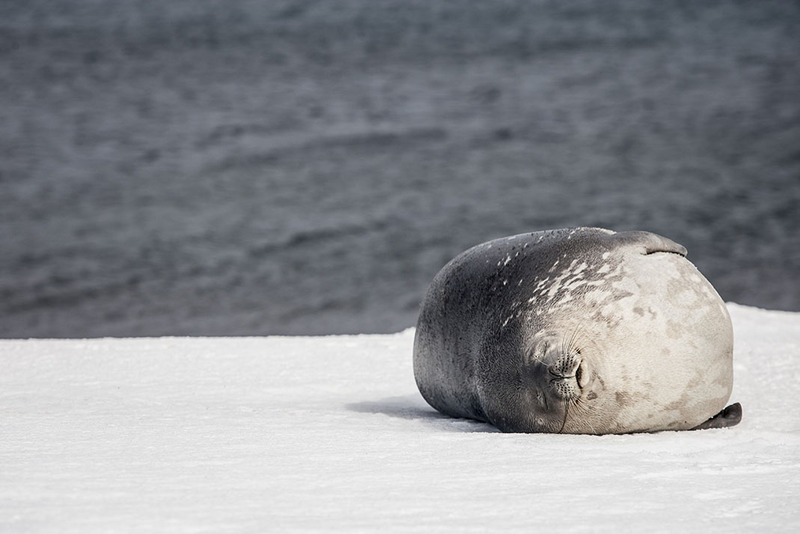 I encountered a few penguins today but also a seal, who was laying belly up right in the middle of our path, sleeping. I stopped and filmed it from afar, not to disturb it. My race was pretty linear as I took no chances, given the difficult terrain. I gathered 70 kilometers today. Just a few more until 250 😉 Tomorrow’s stage will be held on Danco Island, where we’ll arrive around noon, so it will be a shorter one. We’ll see tomorrow how things will settle. 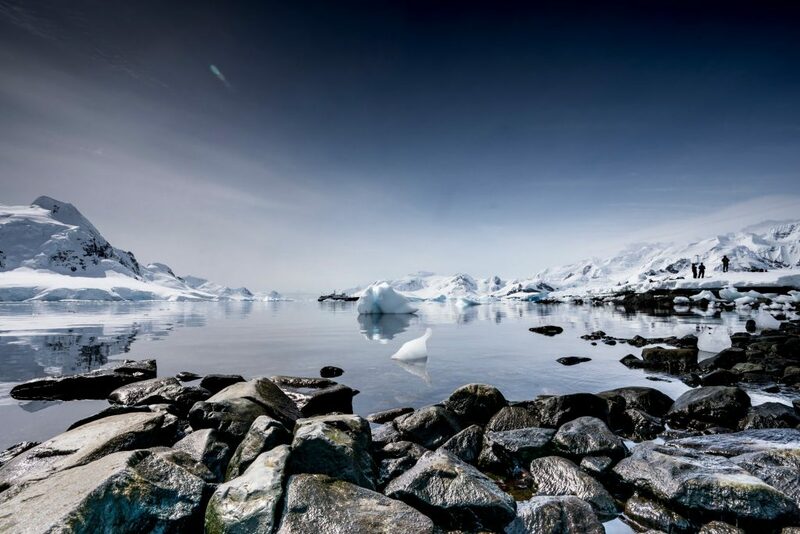 noon Plancius made his way among the icebergs, slowly but safely, close to Danco Island. The surrounding landscape was simply astonishing. I wasn’t sure if I was watching a National Geographic documentary or I was really there myself. 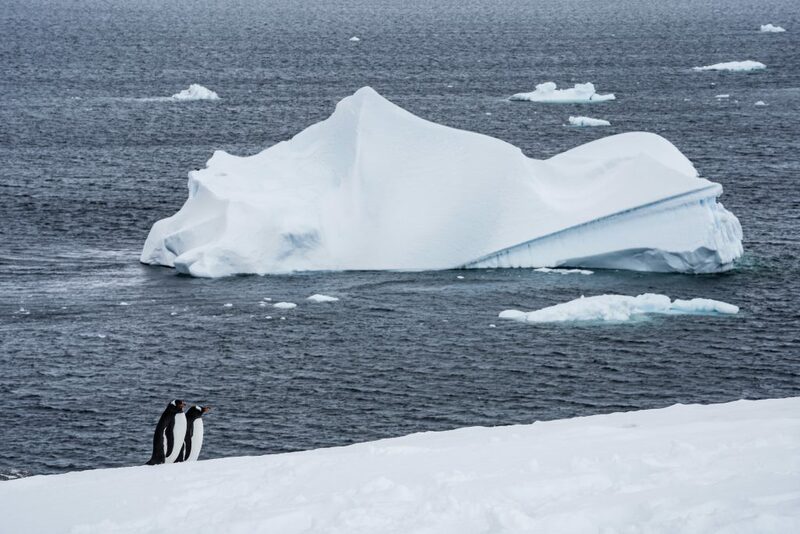 There were bigger or smaller icebergs floating around the ship, which was surrounded by a few playful penguins. Two hump wales were also spotted a little earlier. 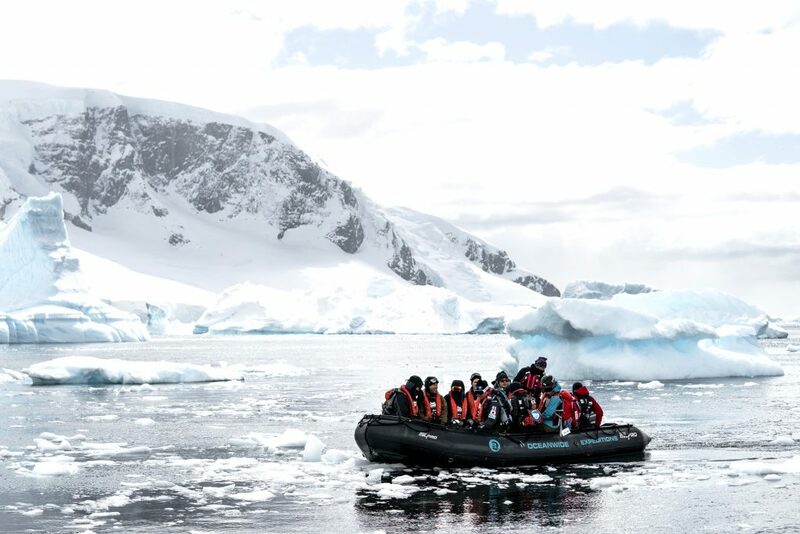 We were taken ashore as usual by pneumatic boats, only to be greeted on the rocky icy beach by a few Gentoo penguins. As I looked up, the whole hill in front of us, the one where we were to run was covered in small black and white dots. Three curious penguins even came close to our landing place to investigate. We ran on a 2 km loop, one kilometer up and the other down in a valley covered in untouched knee deep snow. The first 2-3 laps were a nightmare to everyone, until snow got settled a little. Then, it went pretty well. I never liked uphill running, but this time I could hardly wait to get back up again, as I would pass by the penguin colony on the top of the hill. One time, a more courageous one even left his group and stood right on the path, in front of me. I couldn’t continue my run until it didn’t deign to move away. Here penguins have the right of way, this is their home. We were stopped after three and a half hours, even if initially the stage was announced to last for 4-5 hours. 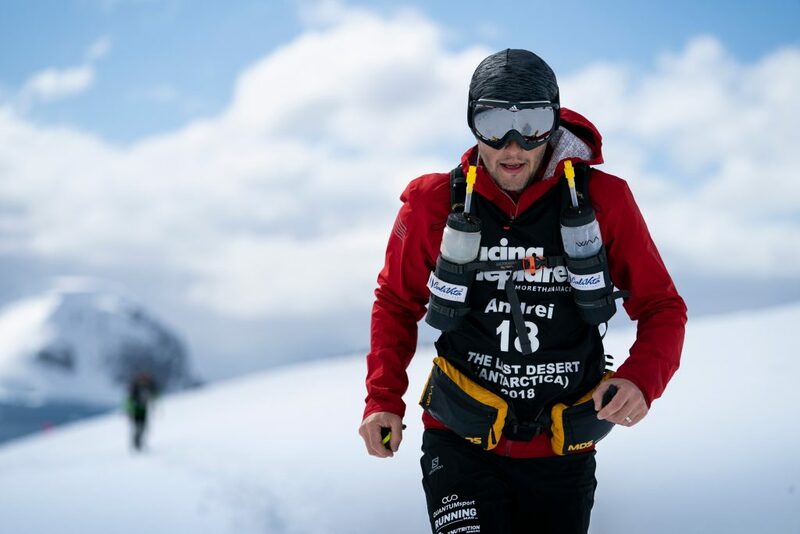 The organizers planned a 10-12 hours run the following day, so they figured a period from 15:00 when we started until 18:30 was enough for today’s stage. I don’t know where I came in the tables with my 24 kilometers, but that is not important to me. Instead, this stage will stay with me forever, in my soul. I keep on wondering on a daily basis on what this place has to offer. And the fact that each stage of this race takes place on a different location only fills my heart with joy. 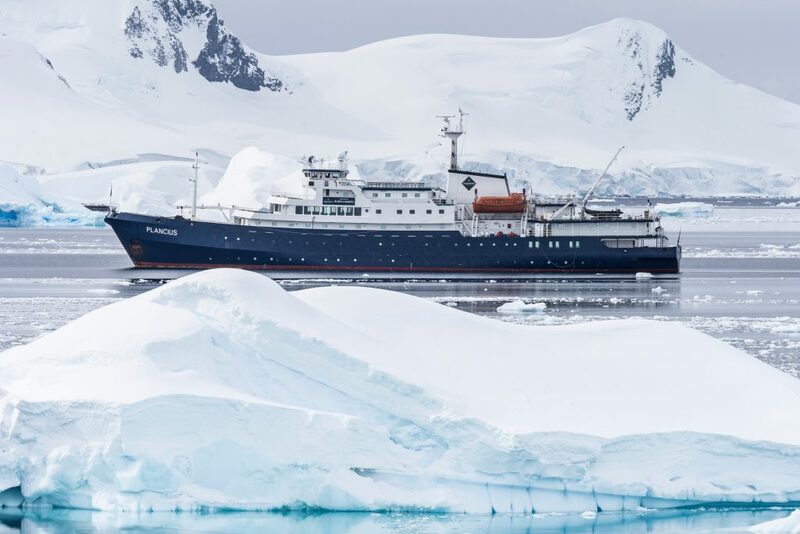 Early in the morning, Plancius arrived close to Paradise Bay, a wild and pristine area in the Antartic Archipelago. As I came out on the deck, I didn’t know where to point my camera first. I managed 42 loops, totaling 56-57 kilometers and almost 2000 vertical meters. Tomorrow it is announced again to be a long day. The idea is to clock as many kilometers as possible in maximum six stages, getting as close as you can to covering 250 km. So here goes the third stage as well. I managed 147 km so far. Hugs, I crawl to bed as I’m dead tired and tomorrow we’ll circle again in a loop for 10 or so hours. At least it is in another location. As I said earlier, nothing can be planned ahead in this race. No certain route or departure time, not even to mention the finish time, and all this solely due to the totally unpredictable weather, that could change literally by the hour. 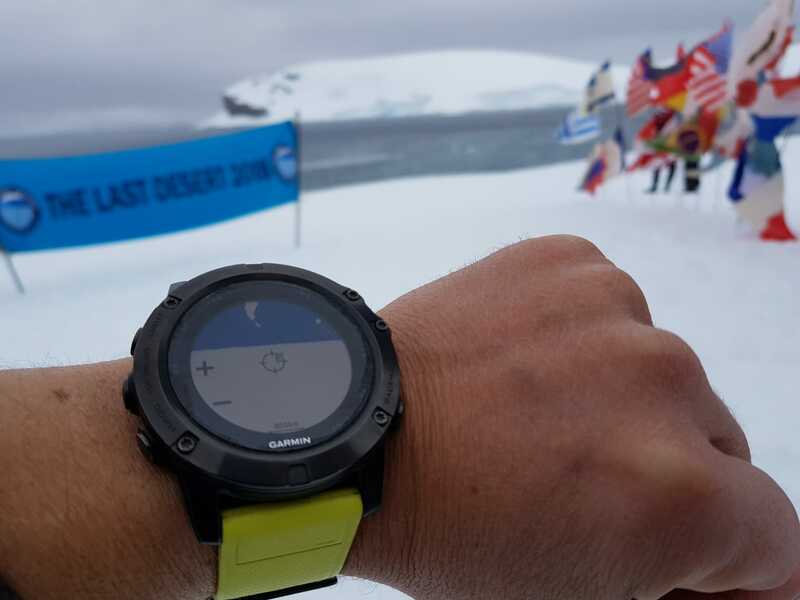 At the end of the 10 hours of the third stage, the organizers told us we would wake up the following morning at 5, then by 6:30 transfer by boat to Dorian Bay for another 12 hours stage, meant to allow everybody to get as close as 250 kilometers as possible. When the weather allows to, the plan is to spend as much time ashore as possible, so that participants could run as long as they possibly can during that window of opportunity. Nobody though happily received the news of another long stage, as we were all dead tired after the third one. It was 21:30 when we got back on the ship and we were to wake up again by 4:30. So we did, as planned. Except that someone up there took pity on us and – as Plancius reached Dorian Bay in the morning – strong wind and high waves didn’t allow us to be transported ashore. So I went back to bed, waiting for the news. We could only reach the shore by 11am, although the wind was still blowing quite hard and also there was sleet pouring down. We started as usual on a loop that, this time measured only 2.4 km where we managed to open a path for us after a few laps. The snow was untouched and at the beginning was knee high; later on, when it got more compacted, the path became easier to run on. 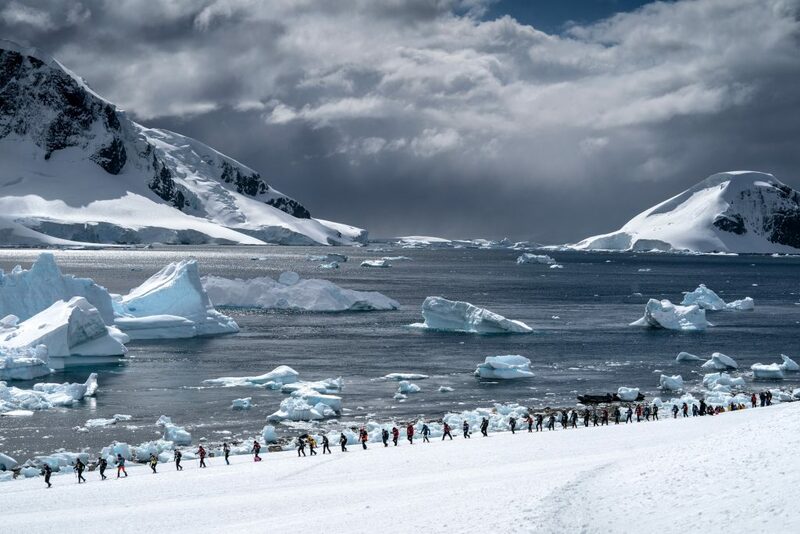 The cold wind made sleet whip my face but even under these circumstances it was impossible not to rejoice as, reaching the top of the hill, we were coming face to face with a penguin colony, curiously looking on our path to see who were the madmen spoiling their tranquility. Then, on the following descent, one was able to admire Dorian Bay in all its glory. The climb on the opposite side of the hill offered a panoramic view of the whole area. Far in the distance, among smaller or bigger icebergs there was Plancius, our home since we left Ushuaia, silently waiting for us to finish the stage and to welcome us aboard again. If weather would allow it, the plan was to run for seven hours. And this time this was exactly how it worked out. After seven hours I managed to cover 52.8 km with 1.700 m positive gain, totaling 202.8 km in 4 stages. 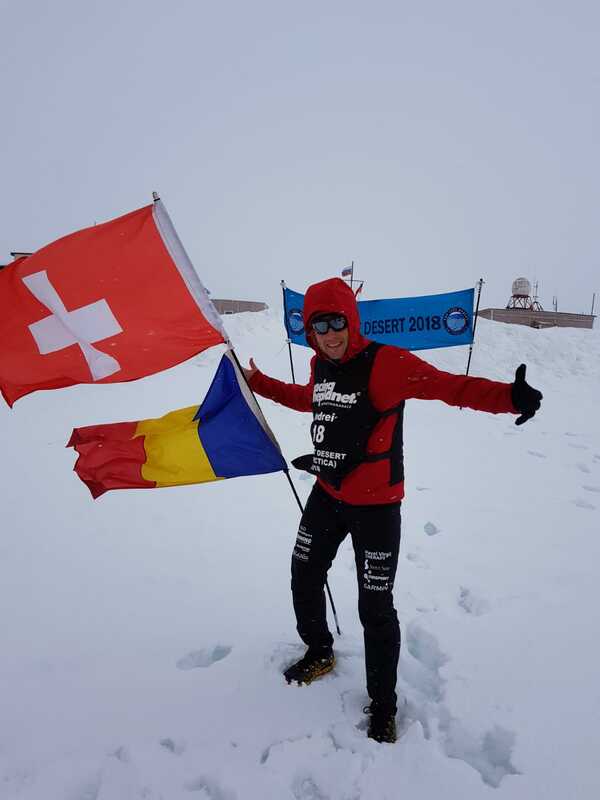 The winner of the race reached today the 250 kilometers mark. 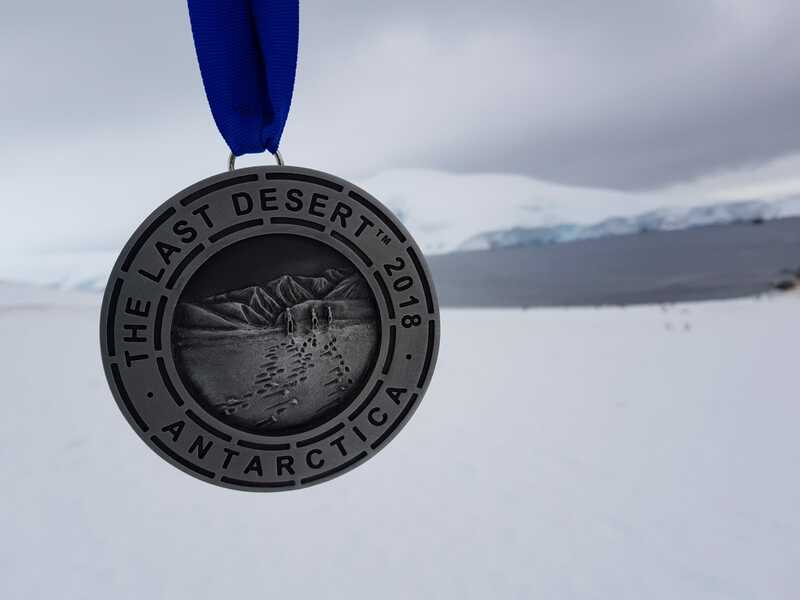 Normally, tomorrow we should have had the fifth stage but the forecast announced bad weather, so most like instead there’ll be the medal award ceremony, on shore. The race finished after the fourth stage, with the general tables listing the total number of kilometers managed by every runner. With 202.8 km I came sixth on the general table, when greatly delighted me, as it is the best ranking I managed in all my CaliVita 7 Deserts races. 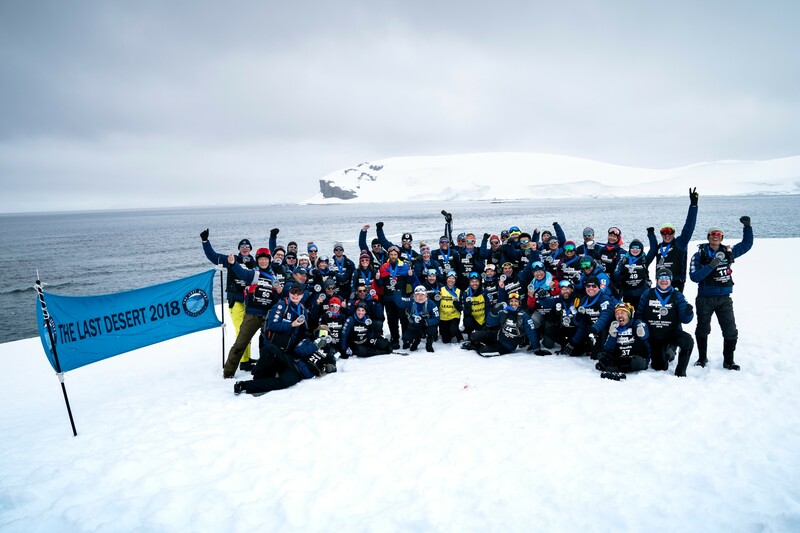 What made me even happier was my whole adventure, starting from the boat trip down to all I experienced in the last week, here in Antarctica. 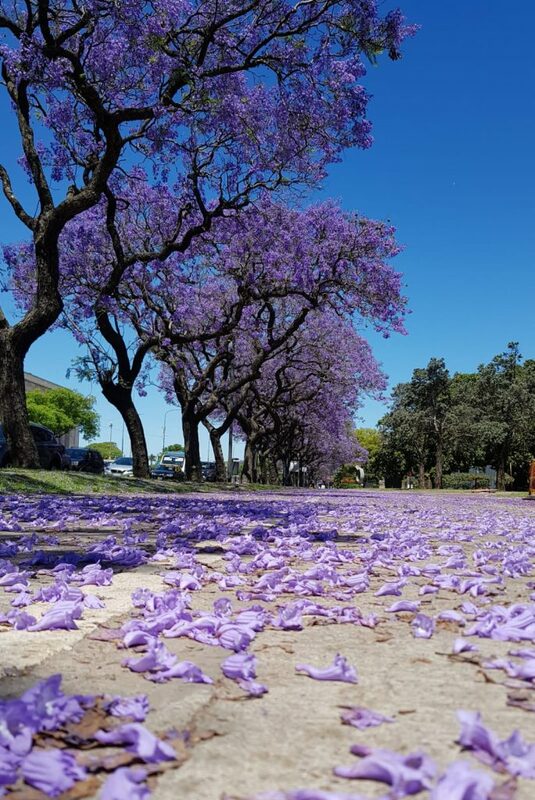 It was indeed a race to enjoy with my soul, and out of all the beautiful places I run in so far, this one has the “wow factor”, that “something” that causes one’s jaw to drop in appreciation. Antarctica, thank you for all you had to offer this week, for the wonderful people I met and for the lifelong lasting memories. I also thank all of you for your support messages. Hugs, from aboard Plancius, sailing back towards home. The race was over and we very well could have been handed our medals aboard Plancius. But organizers decide (and it is best they did) to go ashore one more final time, in a little bay of D’Hainaut Island, for the medals award ceremony. Pictures were taken, we hugged and rejoiced like children, each for his or her own success and all for the wonderful adventure we experienced together. 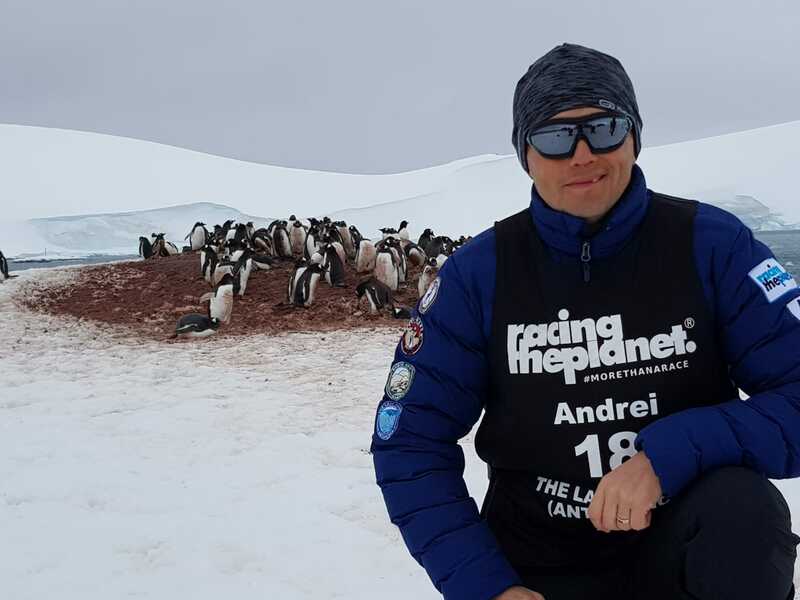 We were surrounded by hundreds of penguins, who were there as if to congratulate us too. It was a moment of immense joy but also regret. 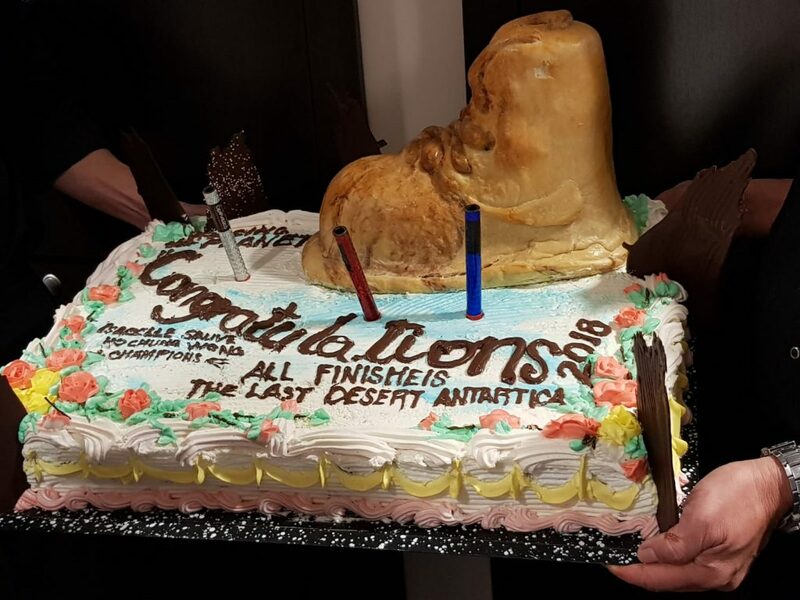 It was the last time we were standing on Antarctic soil. 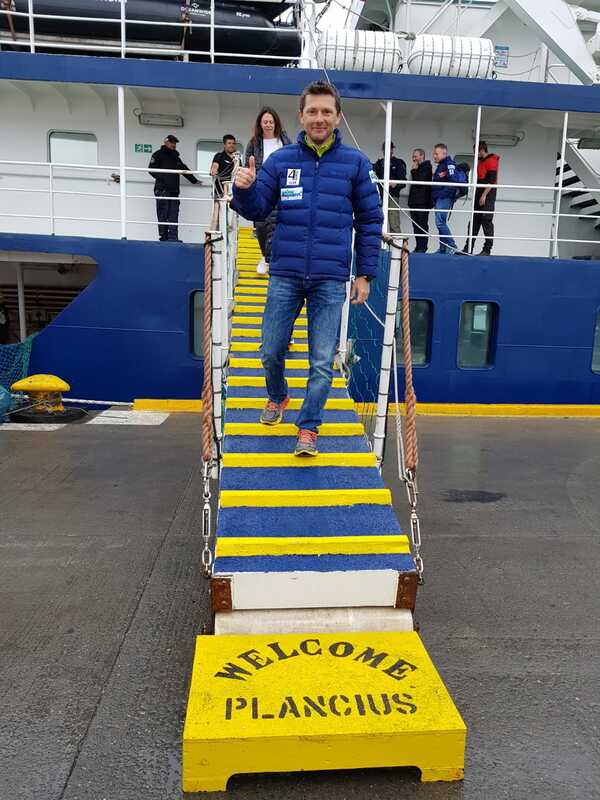 Once aboard Plancius, we would only set foot on land again in Ushuaia. It was obvious how each of us was trying to stall, to take another picture, and then another, only trying to postpone the moment of departure. Inevitably though, the time came to leave the bay in our pneumatic boats, wearing our medals, and leaving behind arguably the best experience of my life. 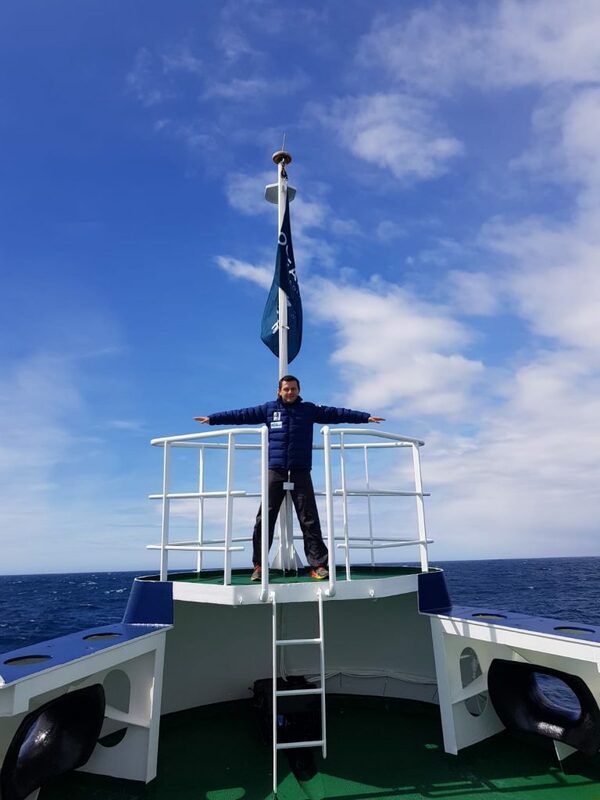 Logbook: Days 9 and 10 – Drake Passage hits again! We’re now sailing towards Ushuaia, in the already famous Drake Passage. I couldn’t finish supper last night, due to the waves. I already got used to eating and grabbing a hold by the table but this time it was too much. I had to leave the restaurant and to lie down in bed, trying to diminish the sea sickness. We all looked like zombies as we walked looking for support by the cabins walls down the ship halls. The following night was absolutely awful. The wind reached almost 100 km/h, and the pitch was so great that our beds were almost moving throughout our cabins. Going to the toilet was a read adventure, as well as even standing up or getting out of the bed. The only solace was thinking that soon we’ll get out the storm area and sail through calmer waters. For at least 24 hours all decks were closed and we were not allowed to get out there. During these two days of tossing around, the staff from Oceanwide Expeditions tried instead to keep us busy by inviting us to attend some really interesting presentations. In one of them, entitled “900 days on the birds’ island”, Mick described his experiences as a marine biologist living for almost three years on a small island in South Georgia, counting seals and taking various samples. The presentation was filled with pictures he took on the island. Then, there were presentations by Eduardo and Kasper, concerning expeditions to the Earth poles, from the first ones to the modern days. 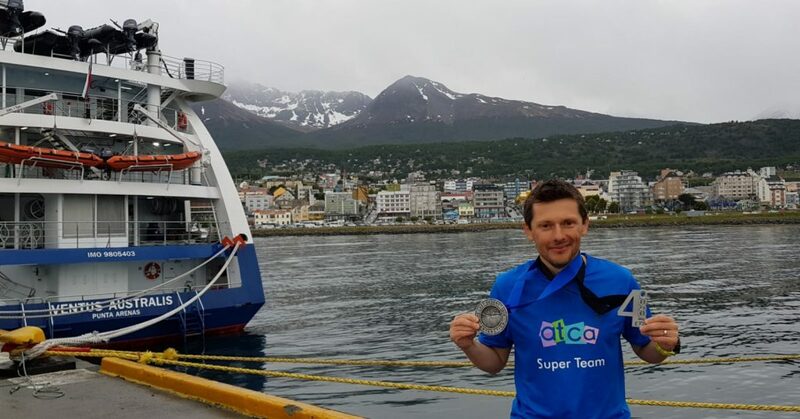 The last evening aboard before pulling into Ushuaia Harbor, we enjoyed a festive dinner and a cake specially made for us runners. 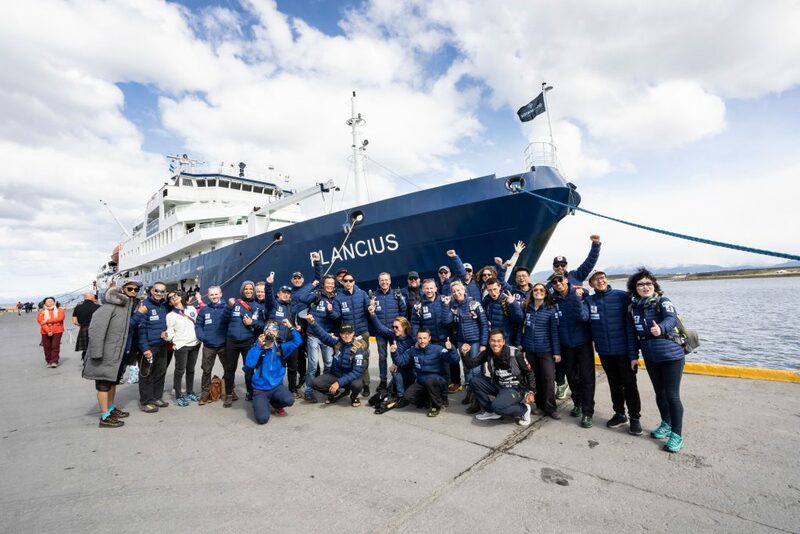 The waves grew smaller and we were able to enjoy some quality time together, to socialize, exchange contact details and take the final pictures and videos aboard Plancius. “There maybe small ships, big ships, but the most important are the friendships”. And indeed, the beautiful friendships that come into being after races like this and the beauty of the places we saw are the biggest win of it all. 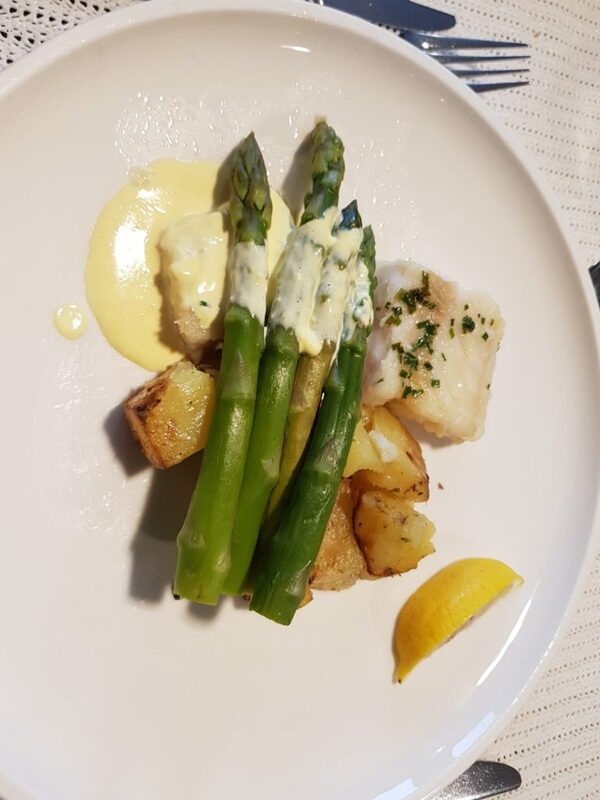 I had difficulties going to sleep after the warm atmosphere of the festive dinner, and this time not because of the sea, which was calm now, but because I wanted to prolong this moment. It felt like I wished I could stop time and be a little longer in this adventure. I rewinded in my mind all the beautiful moments of the last ten days and I felt grateful for what I experienced. At 5am Plancius reached Ushuaia and we could hear for the last time in our cabin’s speakers the warm voice of our expedition leader, Ali Liddle: “Good morning everyone! 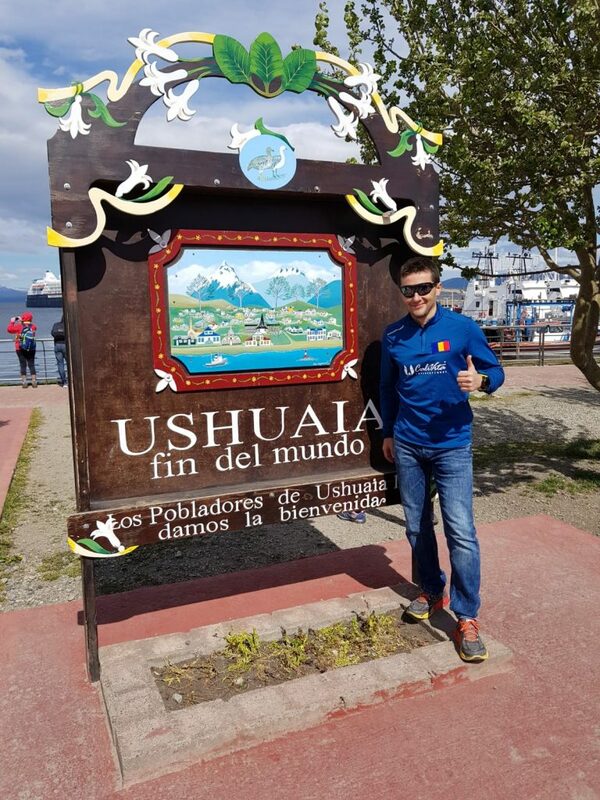 It’s 3rd of December 2019 and we’ve reached the final destination of our adventure, Ushuaia…”. Then there was breakfast, getting off the ship and again pictures, hugs, and promises to meet again. Truth is, out of the 50 participants, in the last two years I already met half of them in various races trough the world’s deserts. Beautiful madmen with sensational life stories, quality people as I rarely met before. It is one of my biggest privileges. 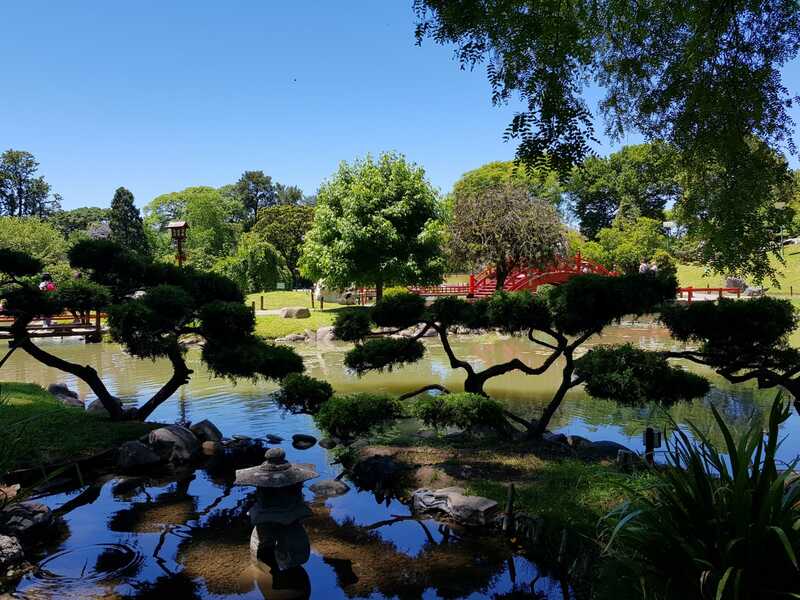 The trip back home – adventure’s not over yet! If you thought this was it and the Last Desert story came to an end, think again and stay tuned. 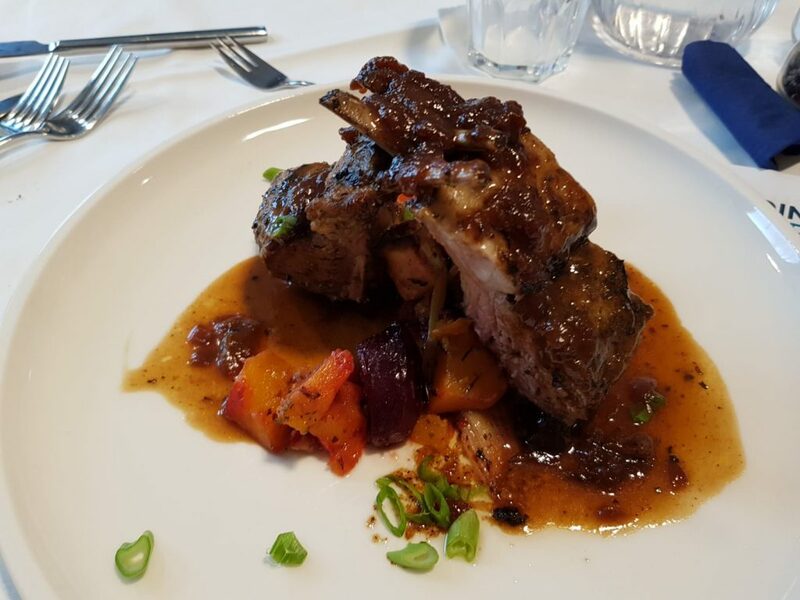 You’ll enjoy what comes next! 🙂 There were a few busses waiting for us in the port, to take us to the airport. I had an evening flight to Buenos Aires, where I was hosted in the same hotel I used on my way in. Everything well, and the flight went smooth this time. As I arrived around 23:00 in Buenos Aires, I encounter the same money issue: I didn’t have enough pesos for the taxi ride to the hotel and the drivers wouldn’t take US dollars. The exchange office in the airport was already closed, so I had to look online for a company with an office in the airport where I could book a cab and pay online with my credit card. I finally arrived at the hotel, somewhere after midnight. My flight home was later, so I still had half a day to stroll on Buenos Aires streets. The same ritual as ten days ago: wake up in the morning, had the so called “breakfast” (two slices of cheese and one croissant), looking for Wi-Fi throughout the hotel, although I don’t know why I hoped something would change while I was away. Of course Wi-Fi only worked in the lobby and there only if there were no more that 4-5 people connected. Aww, how I missed the fast internet in Romania! I checked out and asked them to leave my luggage in the reception for a few hours as my flight was scheduled late in the evening, then I left for the final shopping on the way home. This time, the hours crawled agonizingly slow, maybe because I was anxious to get home and hold by little girl and my wife. I missed them so much and the only comfort was the thought that it would take only a little longer until we’d be reunited. I returned to the hotel around 6pm, spent one more hour there then I figured I’ll start towards the airport. There was a bus passing right in front of the hotel and which normally took one hour to the airport. So, by 7:30pm I was already in the bus station and I waited, and waited and waited some more. It was some sort of bus terminal from where lots of busses were coming and going. I kept looking for bus number 8. Half an hour later, there comes one. As I try to board it, they tell me that this one wasn’t going to the airport and I should check what’s written on it as there are several routed for the number 8. Perfect! On top of this, no one spoke English, not even youngsters. And my Spanish… we’d better not even mention it. One hour later, I see two locals approaching, carrying bags so I thought: “Clearly, these two are headed for the airport, let’s stick close to them”. I tried in vain to exchange a few words in English … nada! Some one hour later, as I started to really panic, here comes my bus. As I board it by the driver’s door and take some cash out to pay for the trip, the driver signals that I need a card which I cannot buy from him but from I don’t know what office. I was already picturing myself trying to convince a taxi driver to accept at least part of the fare in US dollars when the two locals – husband and wife – who were waiting behind me told the driver to let me in, as they’ll pay for my fare with their card. They didn’t accept my offer to pay them back. I was relieved that I finally made it and I was inside the bus. 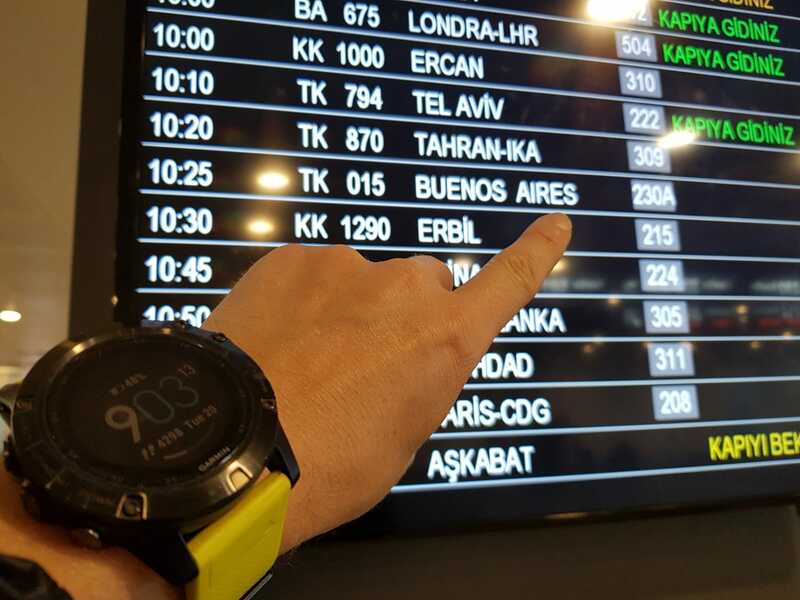 As I checked my watch, I thought that in theory I was ok; in real life, though, instead of taking one hour, the bus made it to the airport in one hour and a half. I was already in “panic, panic, panic” mode. As soon as the bus doors opened, I started racing towards the check-in area. In that instance I remembered a famous movie called “The Terminal” featuring Tom Hanks, where due to a complicated political situation his papers are not accepted and he must take residence in JFK airport until things settle down in his own country. With me things were way simpler and I said it to the Turkish Airlines employee in a totally franc manner: I still got 40 dollars on my credit card and 600 pesos cash (about 20$), so nothing even close to 680. Do you have an opening around here for a few days so I could gather the required amount? Now with everything worked out and my seat booked for the next flight, it began the long and tormenting fight with the clock. I got through all possible mental states: sleepiness, nausea, exhaustion, impatience. What was very frustrating was that the seats in the waiting hall were quite a few, so every time I got up to go to the toilet I would lose my seat and had to walk all over airport for several dozen minutes until I could find another. I could not sleep as I had my entire luggage with me. So when I finally queued at 22:00 to check-in I probably looked more dead than alive, so much so that I probably spooked the guy who one evening prior gave me the news that I lost my flight. When he heard that I waited in the airport he said he’d talk to his colleagues for a seat near to one of the emergency exits (where there is more room for legs). Unfortunately, that wasn’t the case. So I finally took off for home, with a six hours stopover in Istanbul. Long story short: while we disembarked from Plancius in Ushuaia on Dec. 3rd in the morning, I arrived home on Dec. 7th at 3:00am! Sponsors? Partners? I only call them: friends! 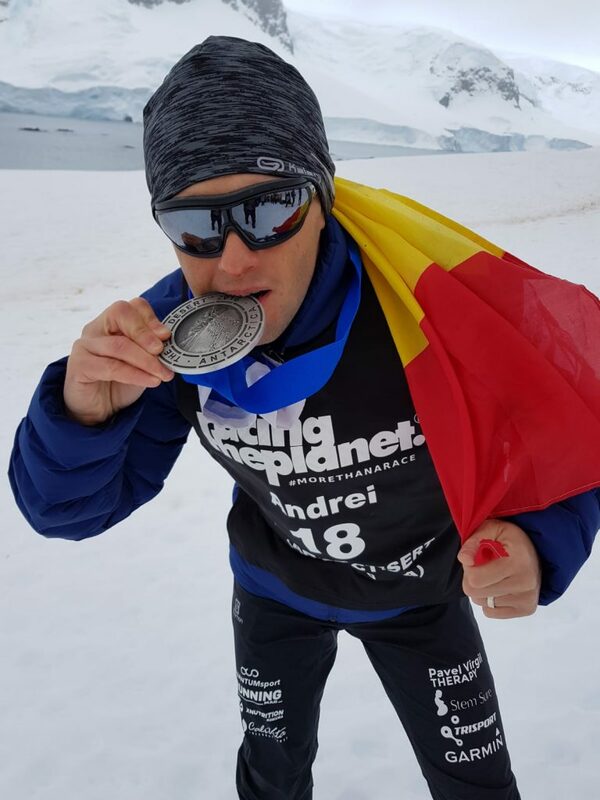 Just like any other race I run in the last four years, I was fortunate to be supported by fine people for the Antarctica race as well, people who wanted to be part of this story and for whom my results did not matter. As a matter of fact, there was no pressure from them regarding this. 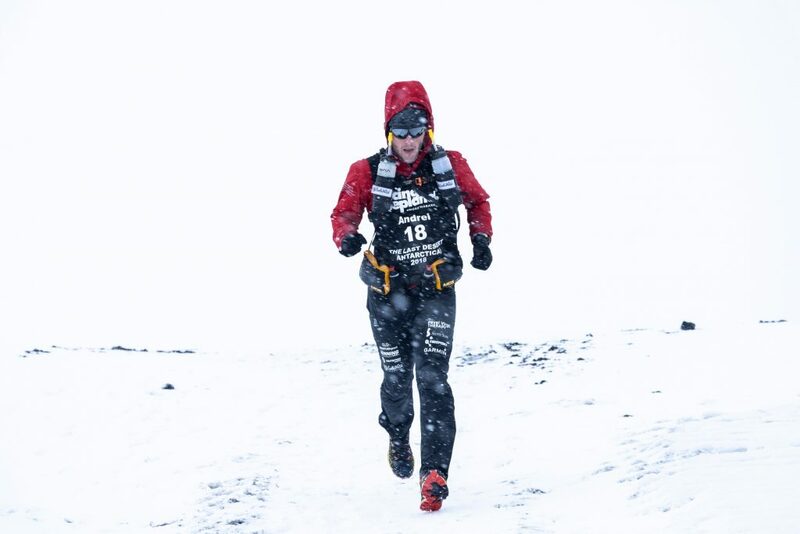 The determination to finish in the top 10 of each race was something I imposed on myself; it was my fight with myself. There was no target of that many posts per week or that many articles on my blog. These were people who appreciated me as a human being in the first place, people who liked being part of this adventure on seven continents, people I call, without any doubts, friends. And as I always been an honest guy who likes admitting the truth, I must say that without their support I wouldn’t have reached any of the accomplishments of these prior years. And for this, I thank you from the bottom of my heart! I also thank you because, during this adventure, I managed to discover – with your help – a new me, first of all. I don’t know if a better or a worse one, a wiser or a more rational one. But for sure one who’s much more patient and resilient and for whom the word “impossible” is just another word in the dictionary. ← I can see you!